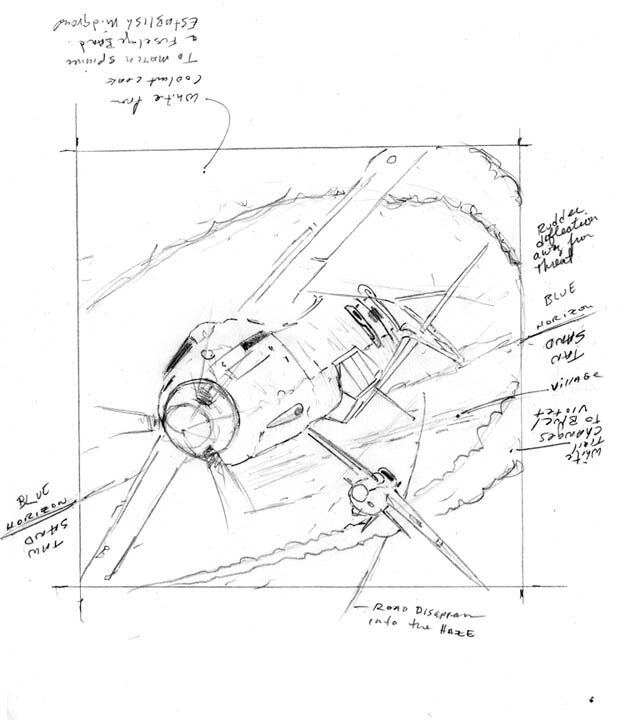 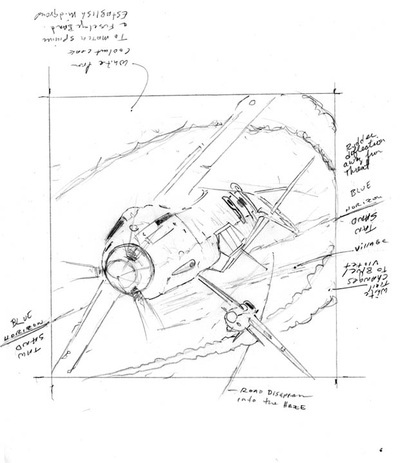 This is a page where you can see my projects progress from concept to completion. 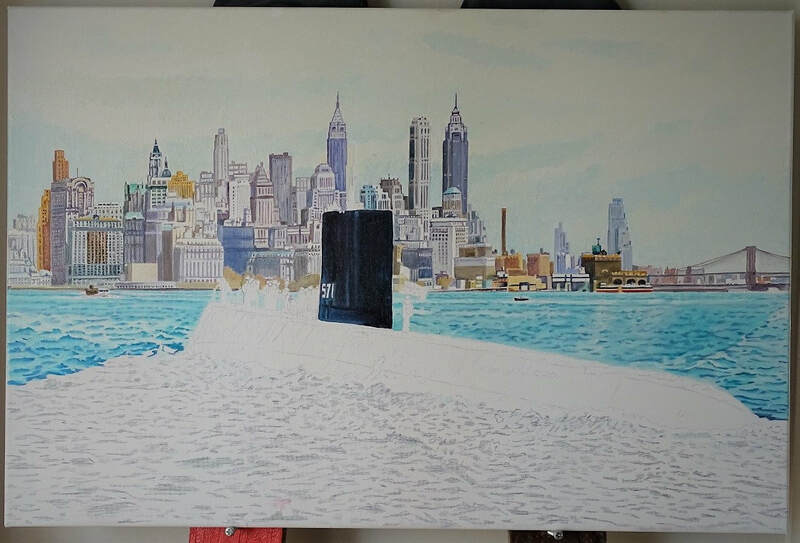 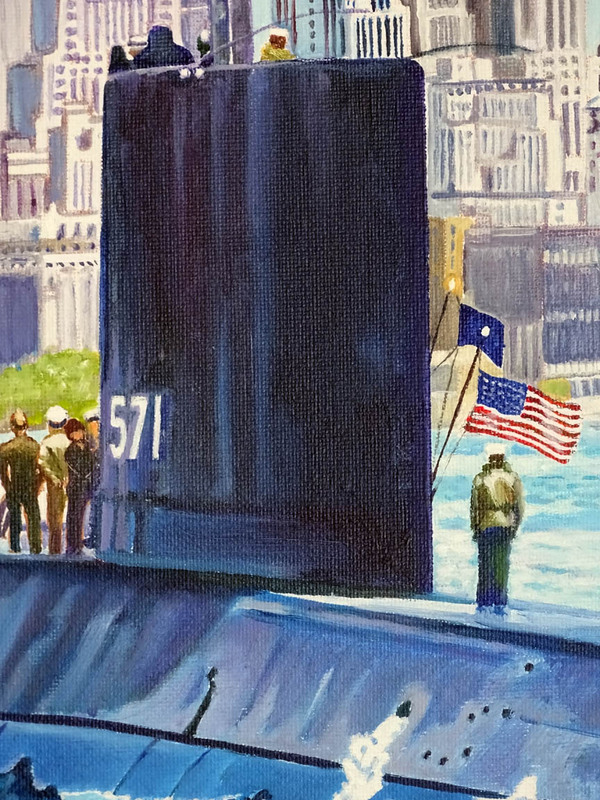 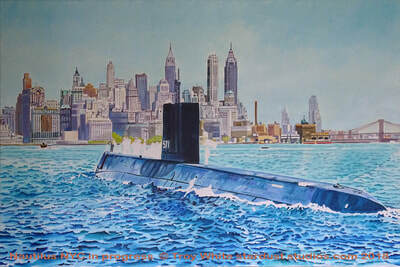 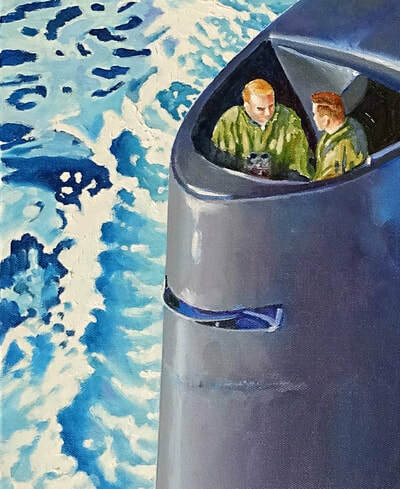 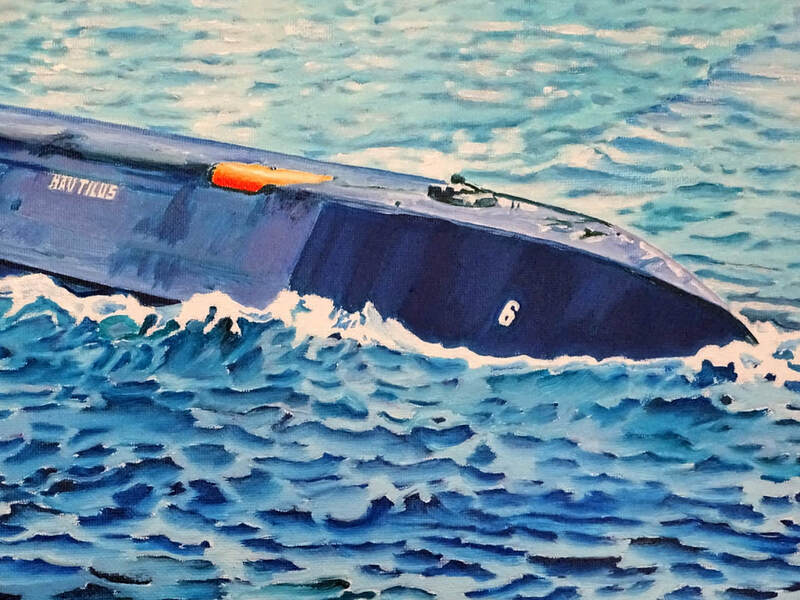 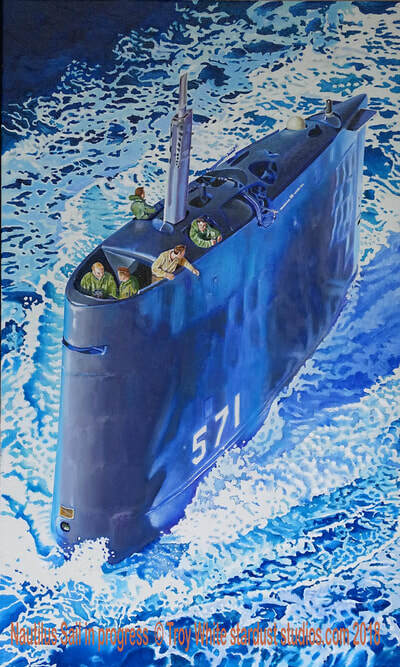 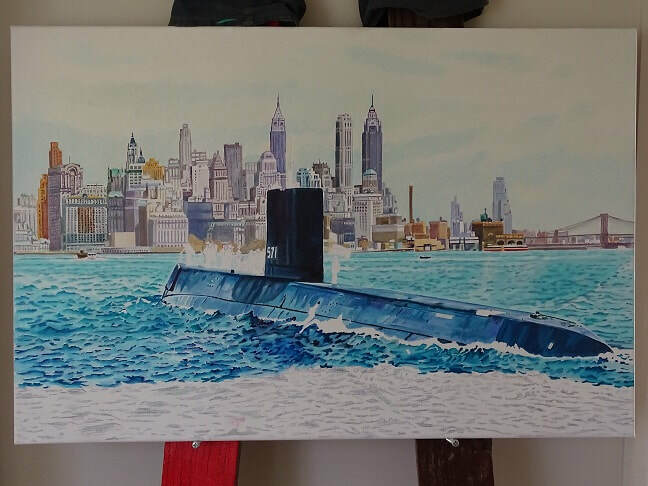 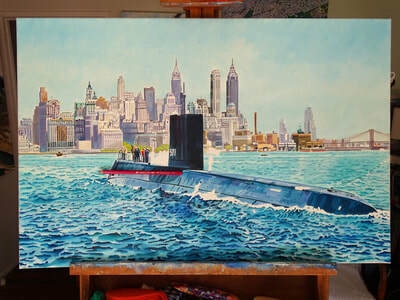 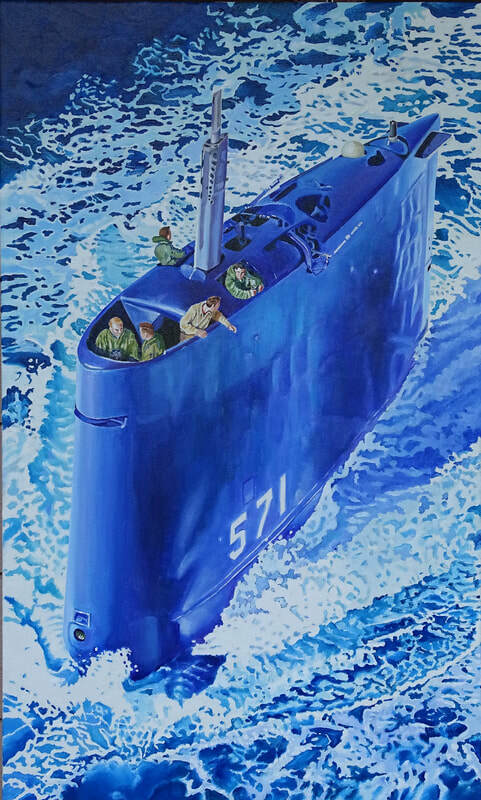 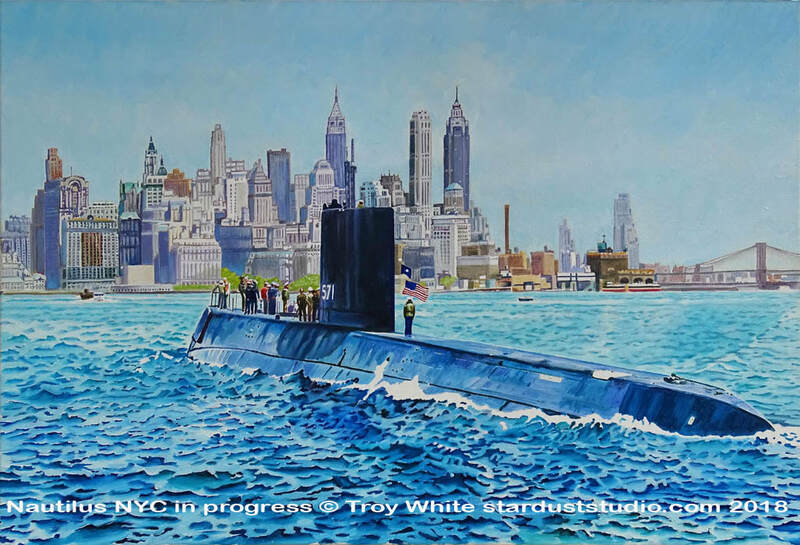 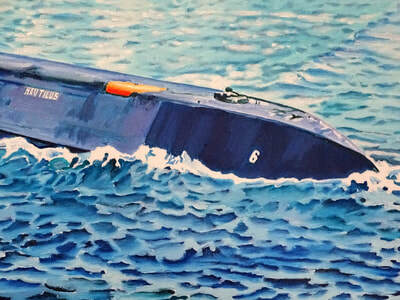 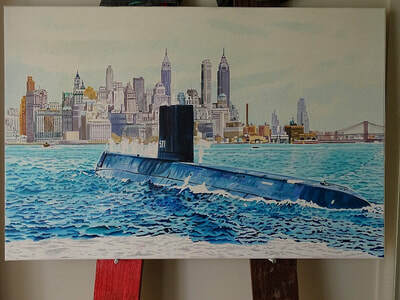 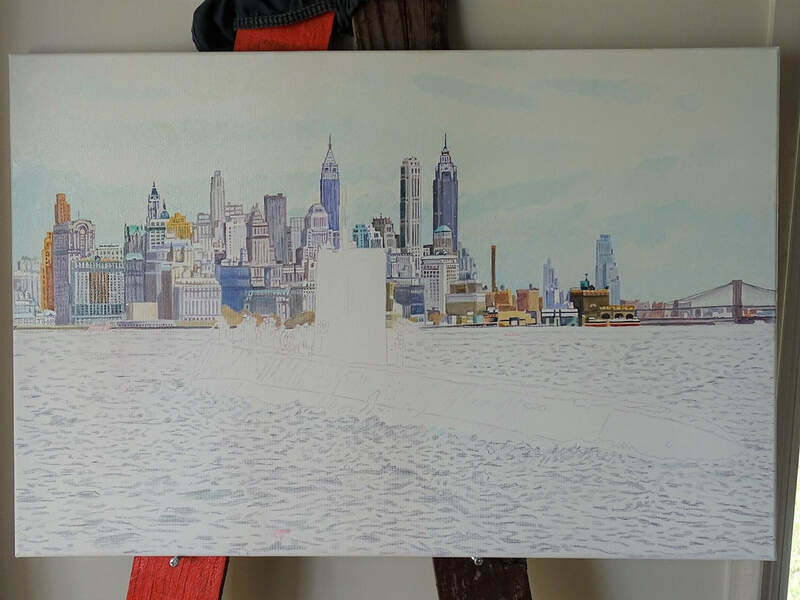 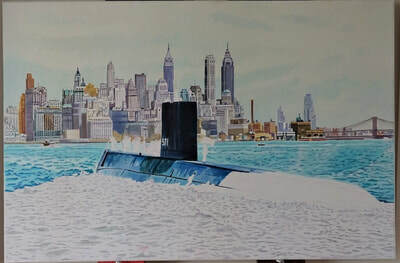 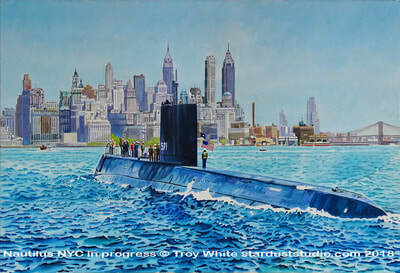 In late 2017 I accepted a commission for two paintings of the world's first operational nuclear submarine: the USS Nautilus, SSN-571. 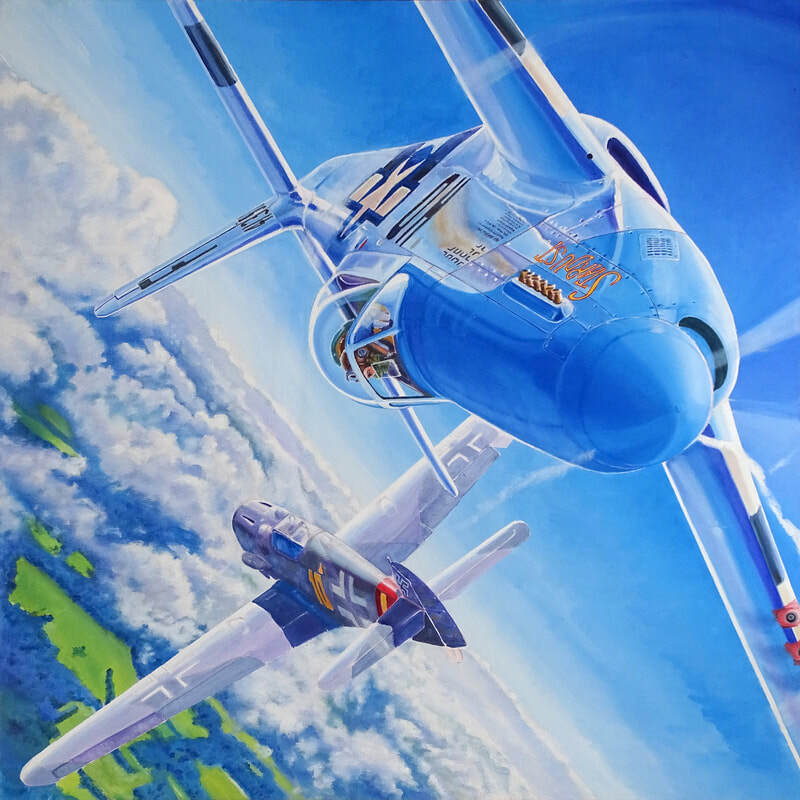 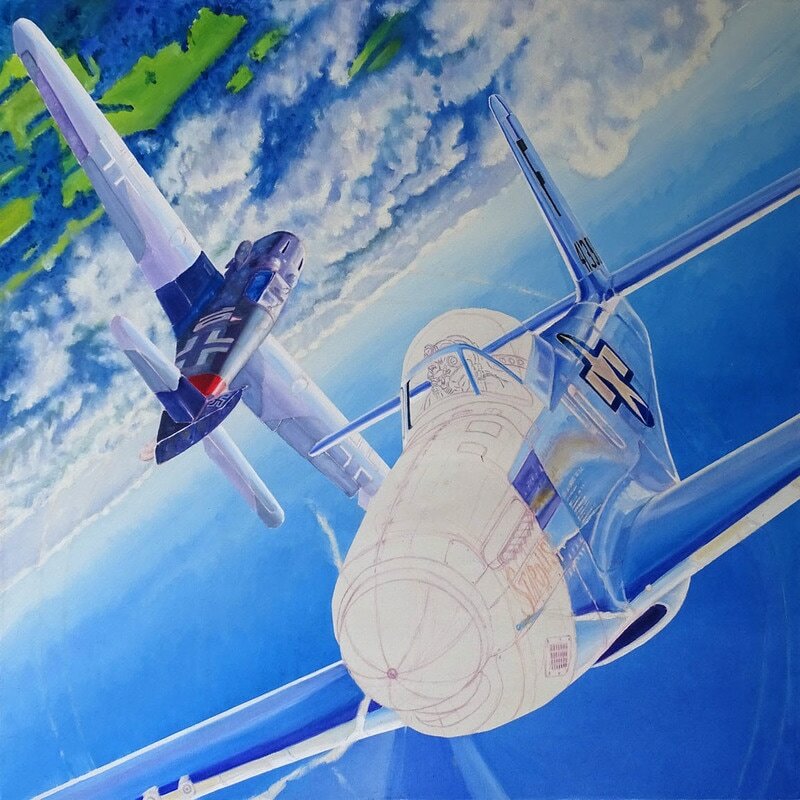 Having spent most of my live as an aviator and painting aviation subjects I welcomed this departure from the sky and the chance to create something a bit different. 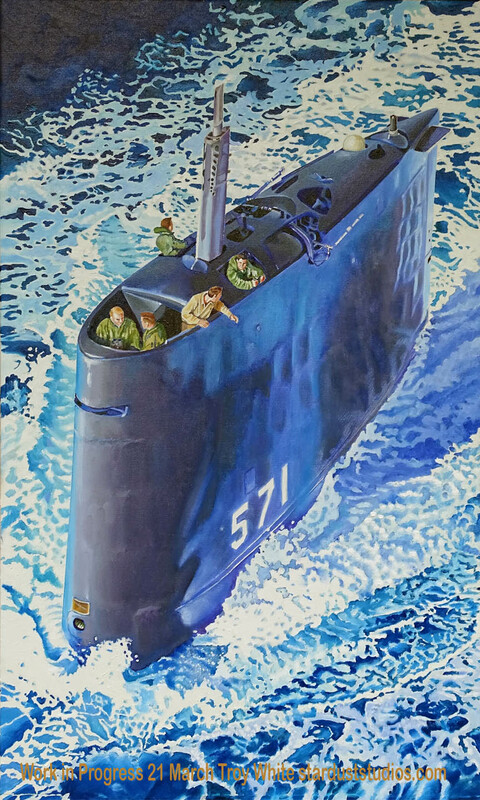 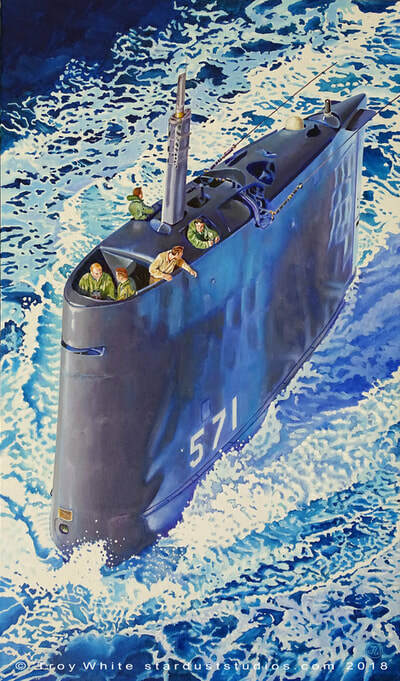 The Nautilus was commissioned on 30 September 1954, on 17 January 1955 she pulled away from the dock and her skipper Commander Eugene P. Wilkinson transmitted the now famous message "Underway on nuclear power." 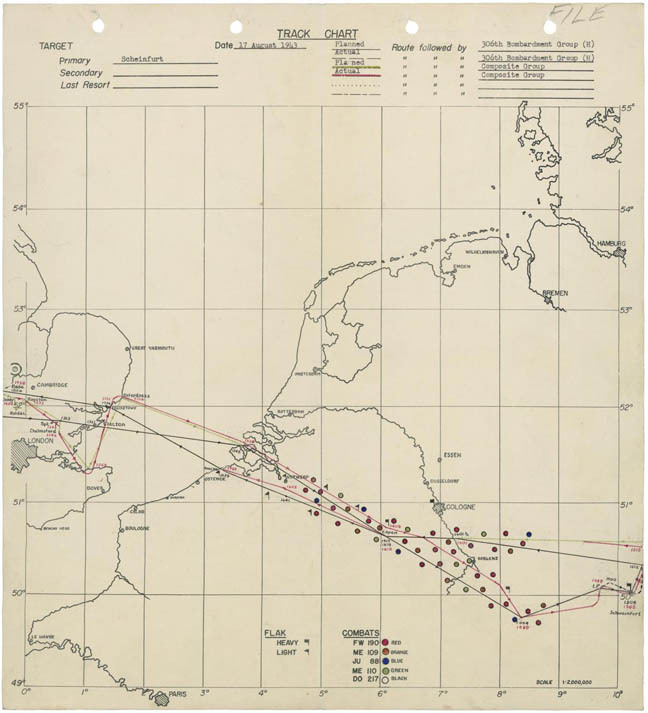 In May The Nautilus traveled 1,200 nautical miles from New London Connecticut to San Juan Puerto Rico in less than ninety hours. It set a world record for the longest submerged cruise by a submarine and at the highest sustained speed ever recorded. In August 1958 with Commander William R. Anderson, Nautilus became the first submarine to travel submerged from the Pacific Ocean to the Atlantic by passing directly under the North Pole. The Nautilus was decommissioned on 3 March 1980 and in 1982 was declared to be a National Historic Monument. 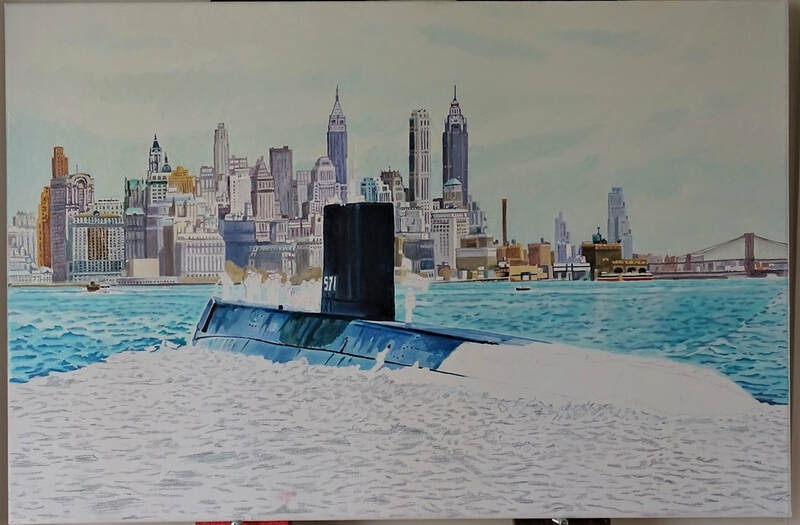 In 1986 she went on display and was opened to the public at the The United States Navy Submarine Force Library and Museum at Groton Connecticut. I wanted to do something different to mark my transition from the type of paintings I've done since 1990 and "Selfie with David Bowie" is it. 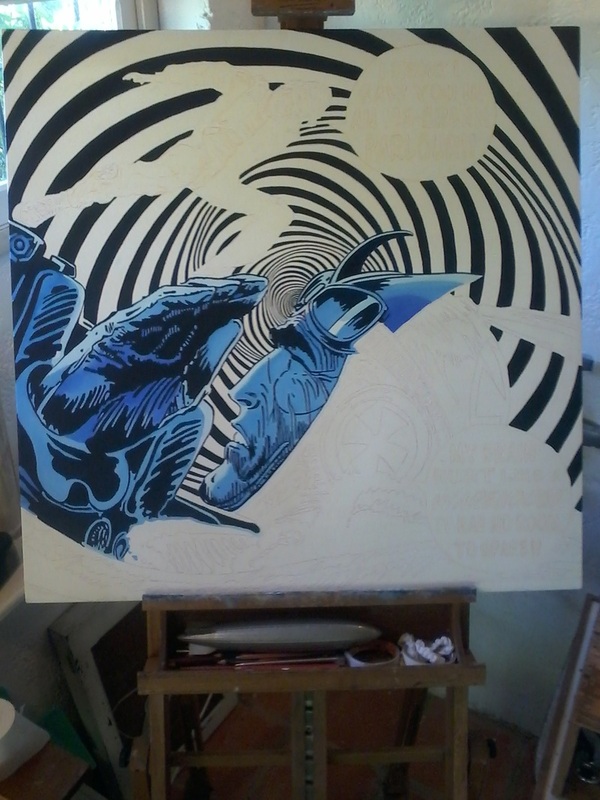 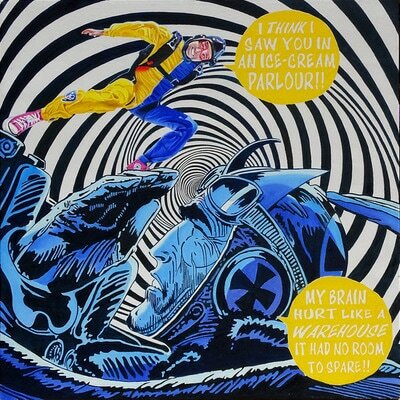 It is an autobiographical piece in a Pop Art - Op Art theme with five elements. It features an environmental message in the form of lyrics from the David Bowie song "Five Years" which was on his album The Rise and Fall of Ziggy Stardust and the Spiders from Mars. 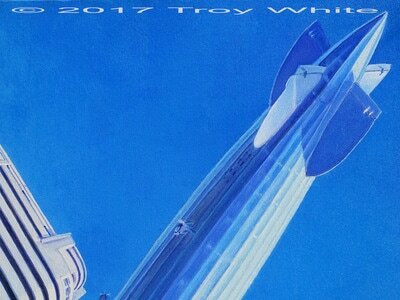 The album which was released in the summer before my senior year in high school is considered by many to be one of the greatest albums of all time. 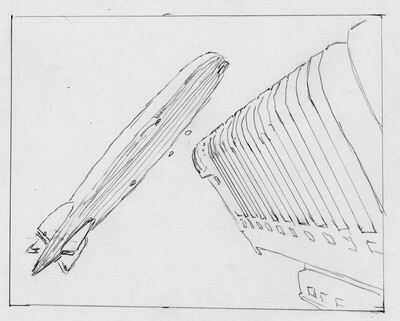 I had the 8-Track tape and the vinyl album. 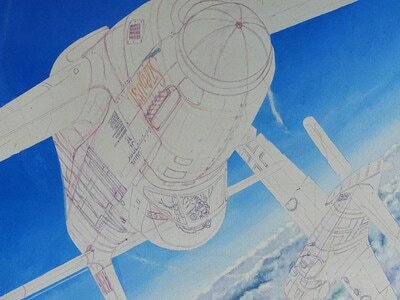 It is partly the reason for me choosing the name Stardust Studios for my business in 1996. 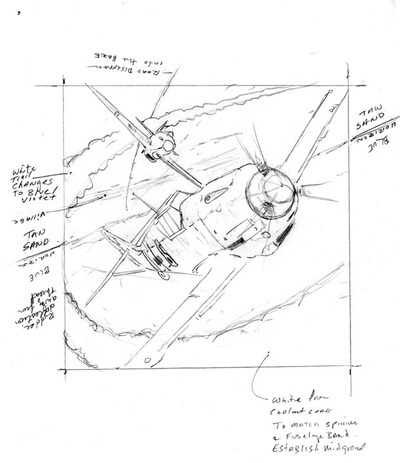 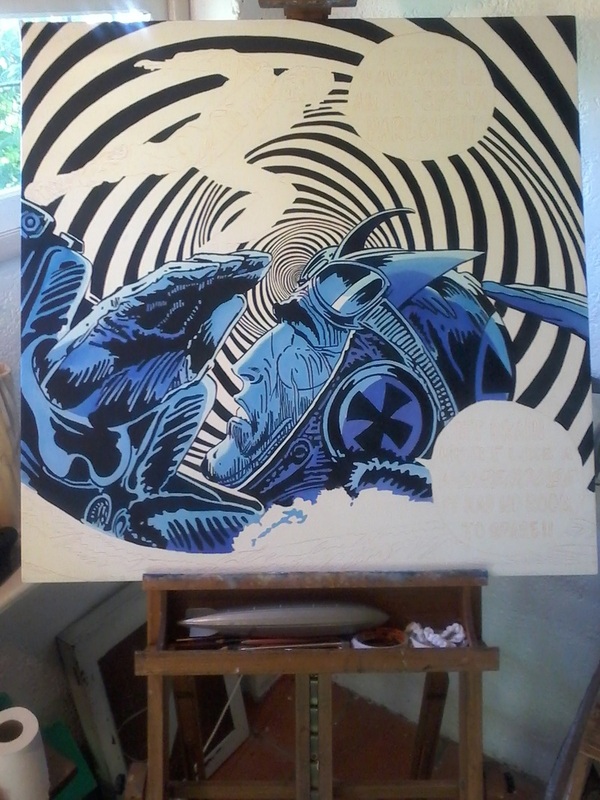 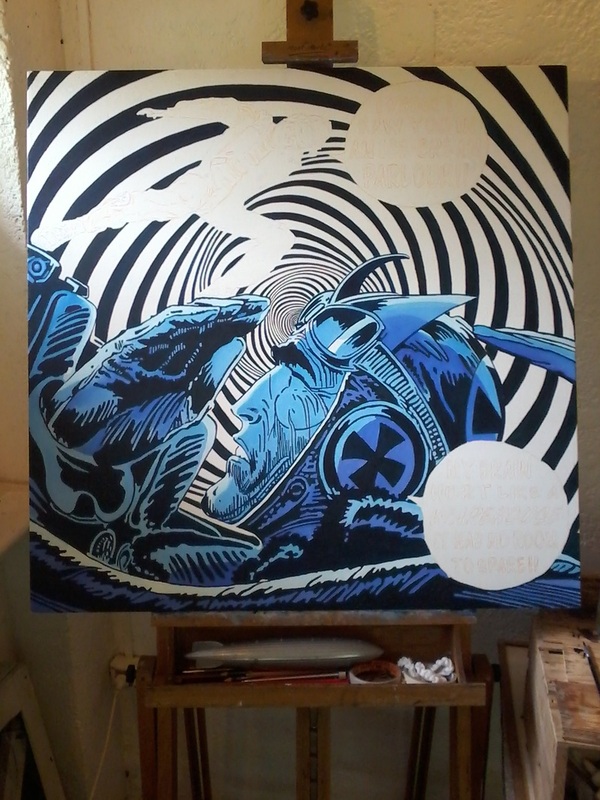 Also featured in the painting is the 1960s comic book super hero "Enemy Ace" as inked by the late great Joe Kubert. 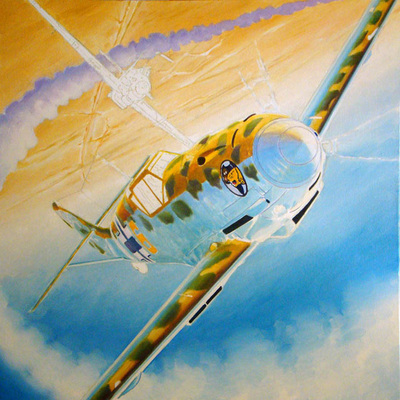 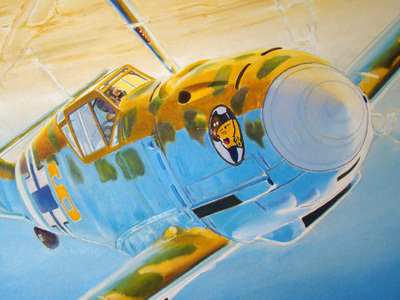 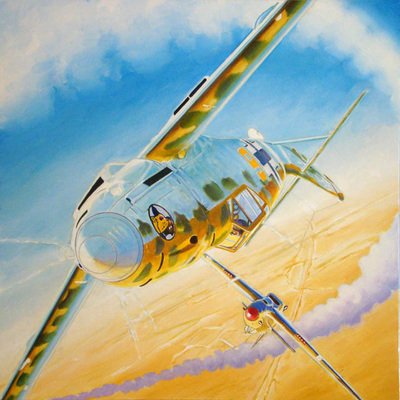 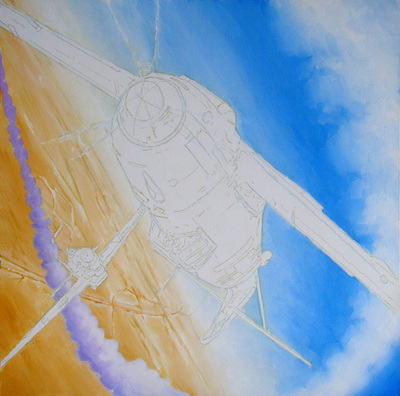 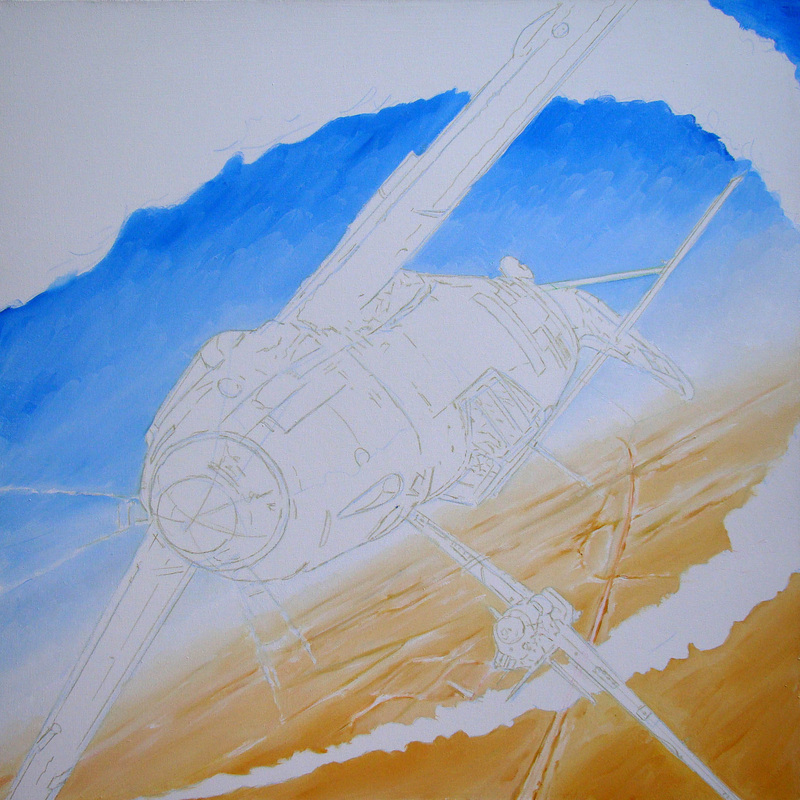 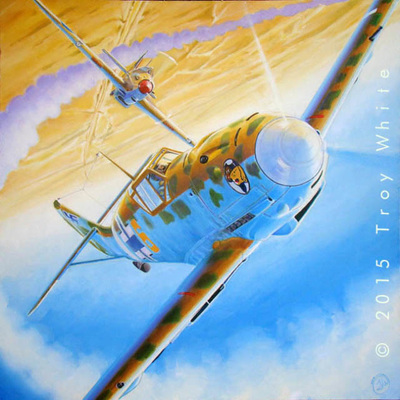 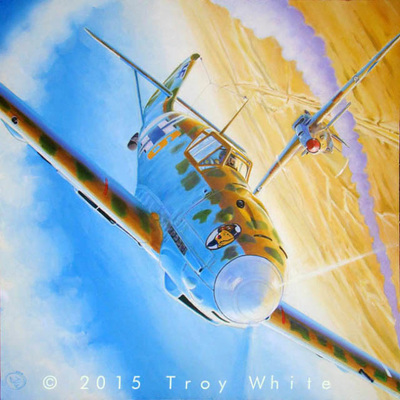 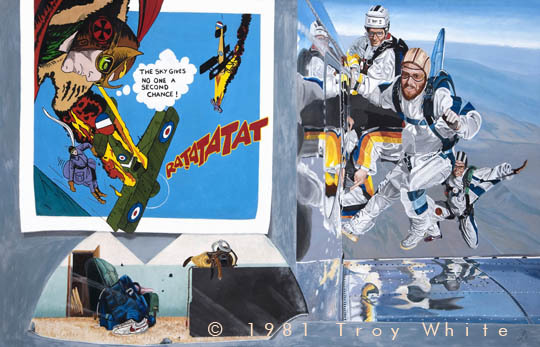 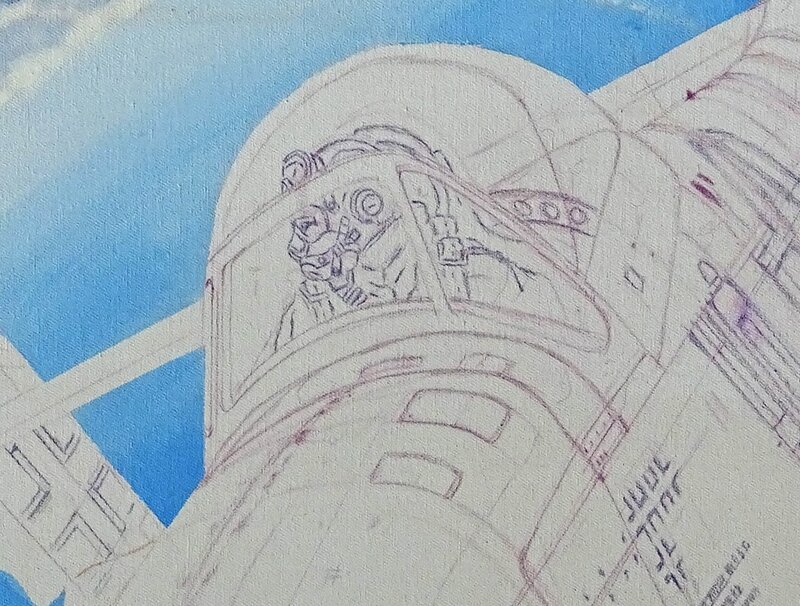 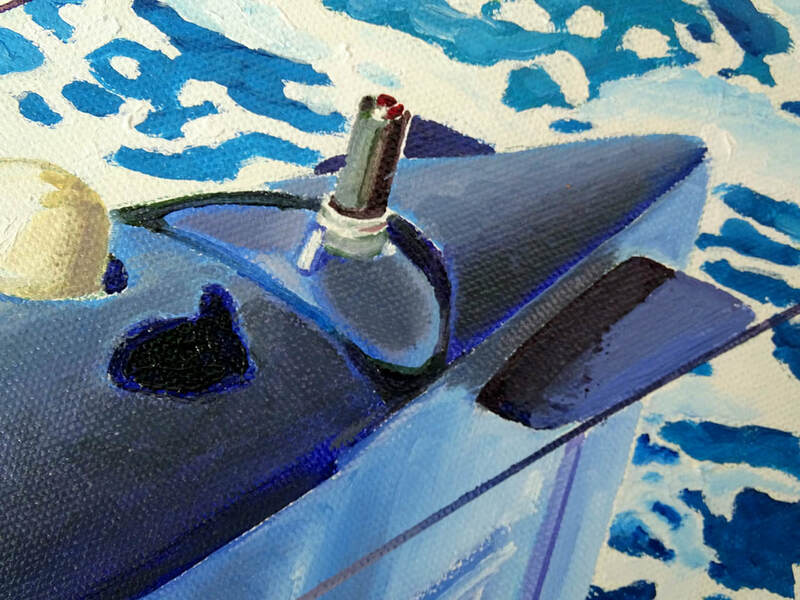 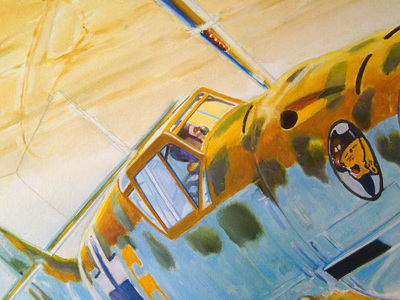 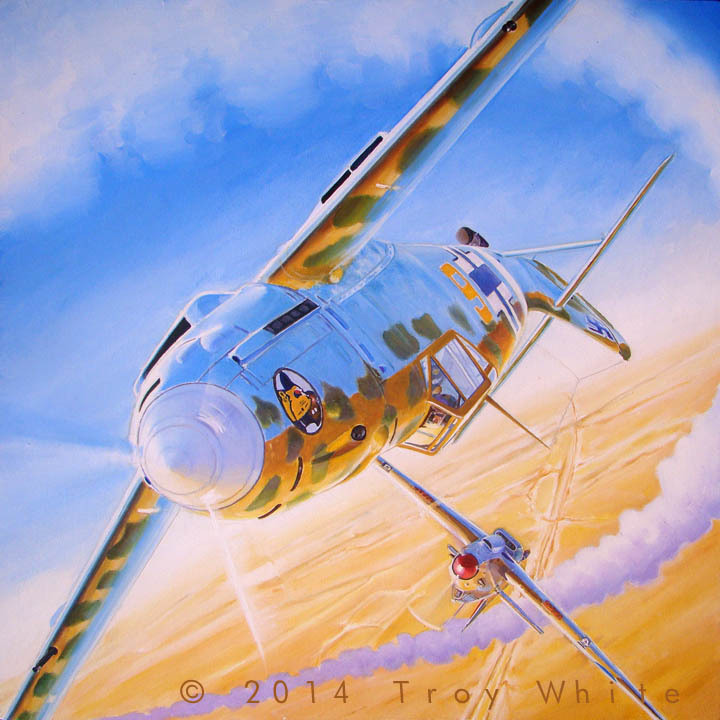 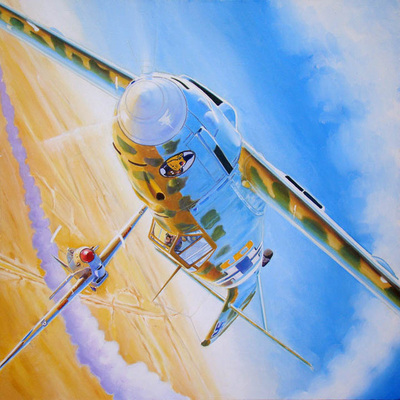 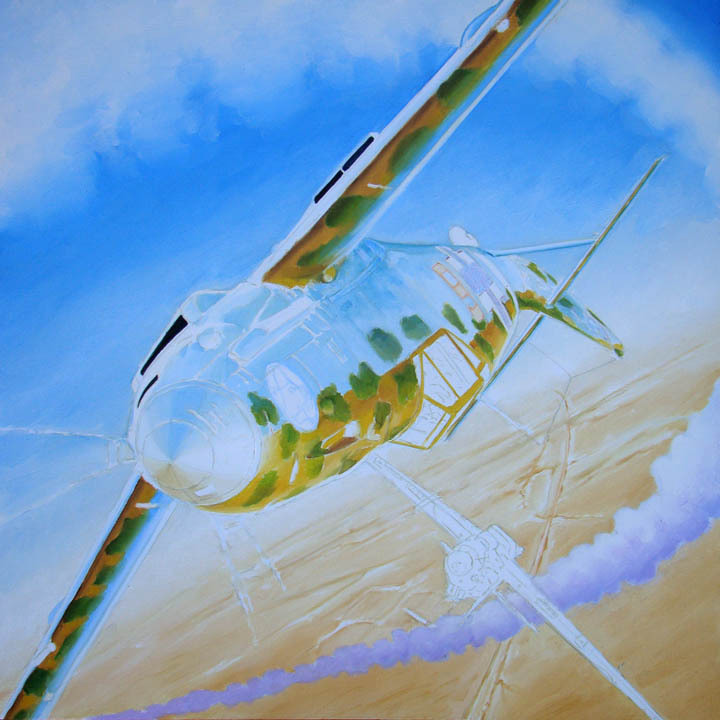 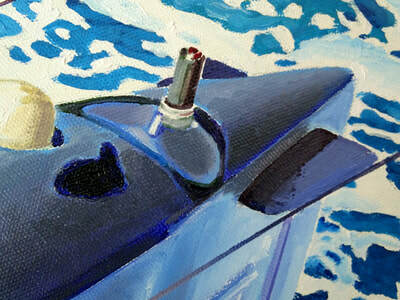 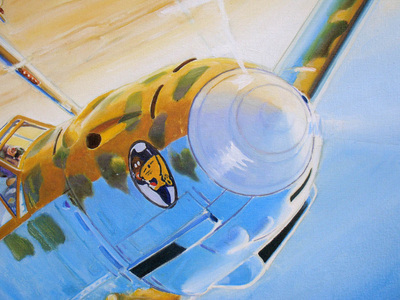 "Enemy Ace" first appeared in my 1981 painting "Ratatatat" which was also autobiographical. 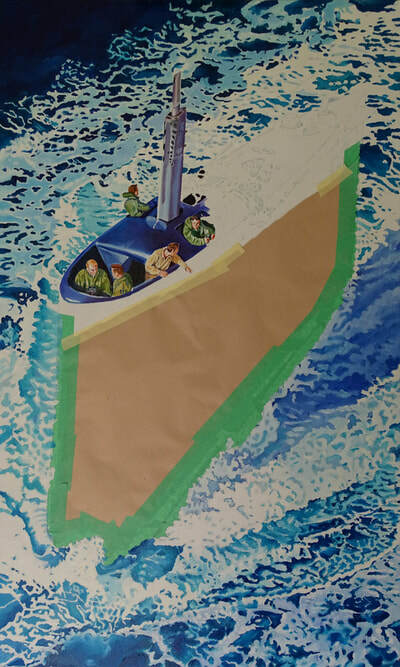 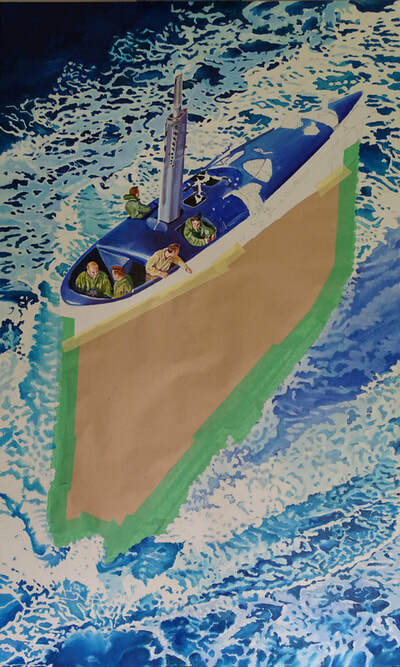 The experience gained during 20-plus years of working in a commercial sign shop and monthly magazine held me in good stead while working on the cartoon portion of this project because I understand the techniques involved with the printing process and am enjoying recreating the effects with oils. 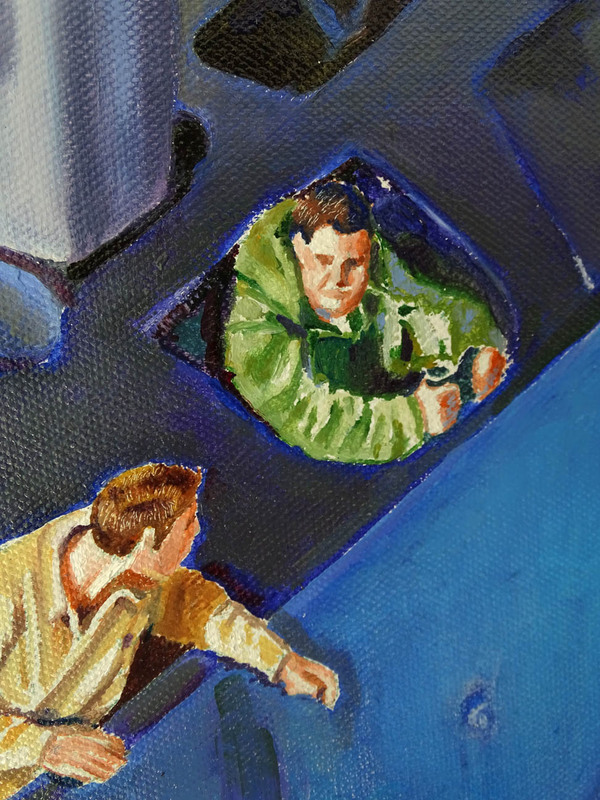 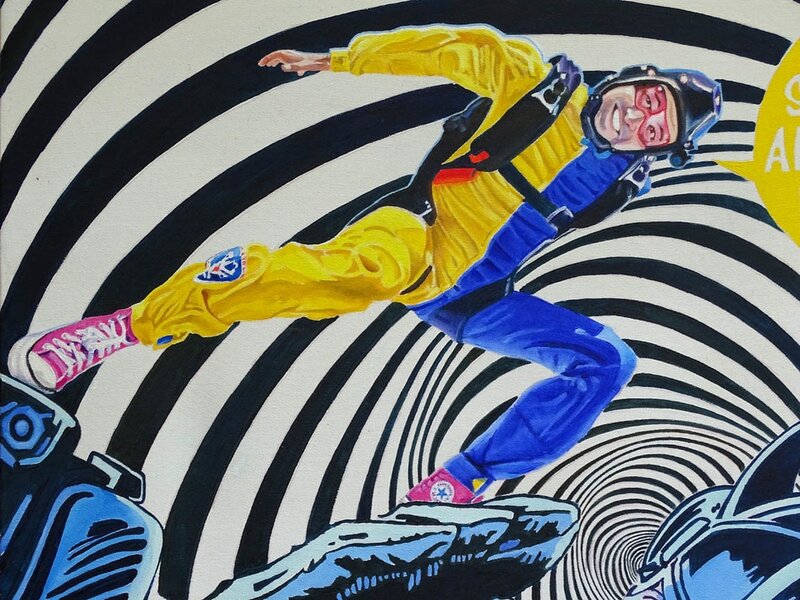 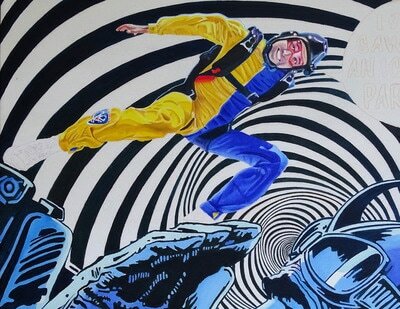 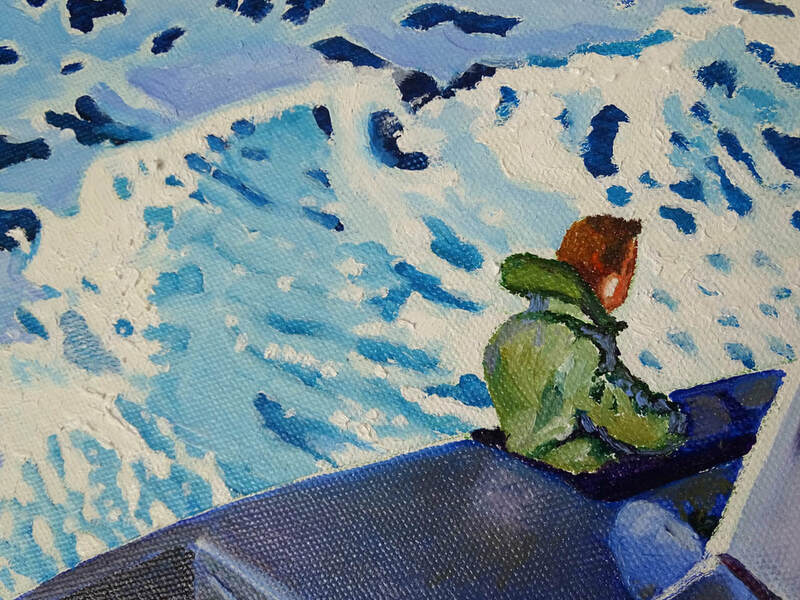 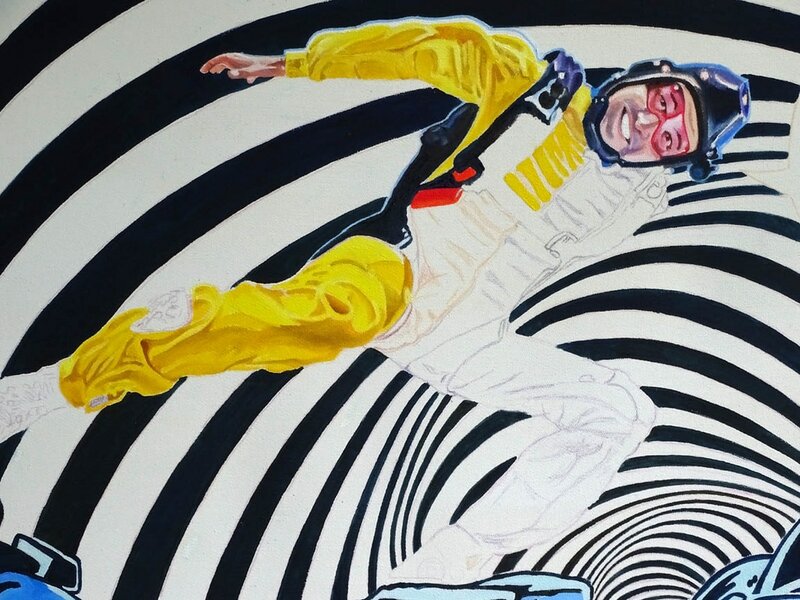 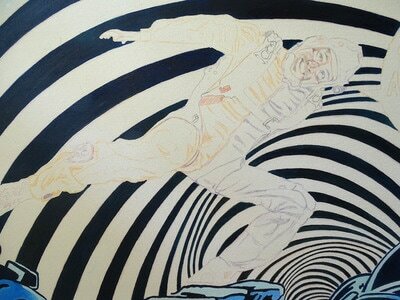 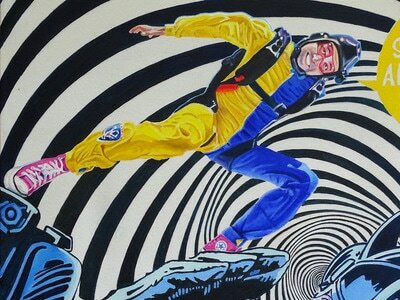 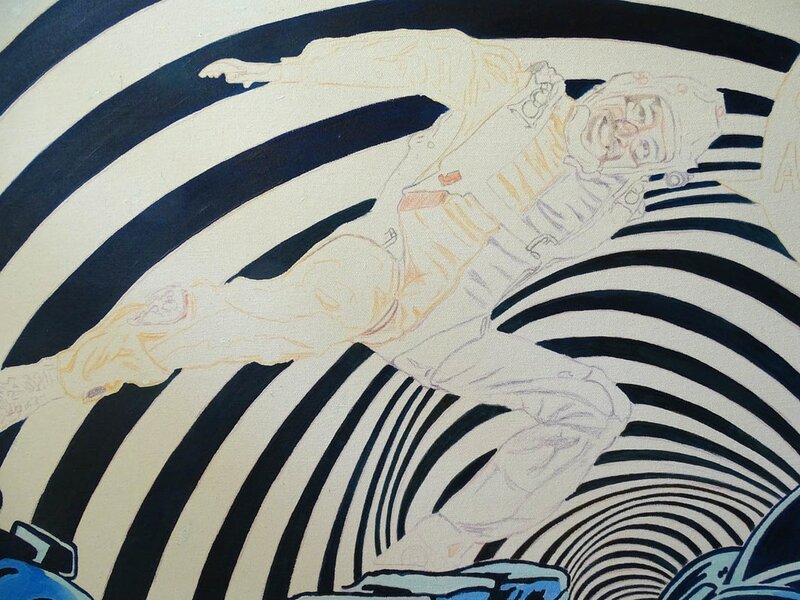 The fifth element in this painting is a skydiving self portrait. "Selfie with David Bowie" measures 90x90 cm. 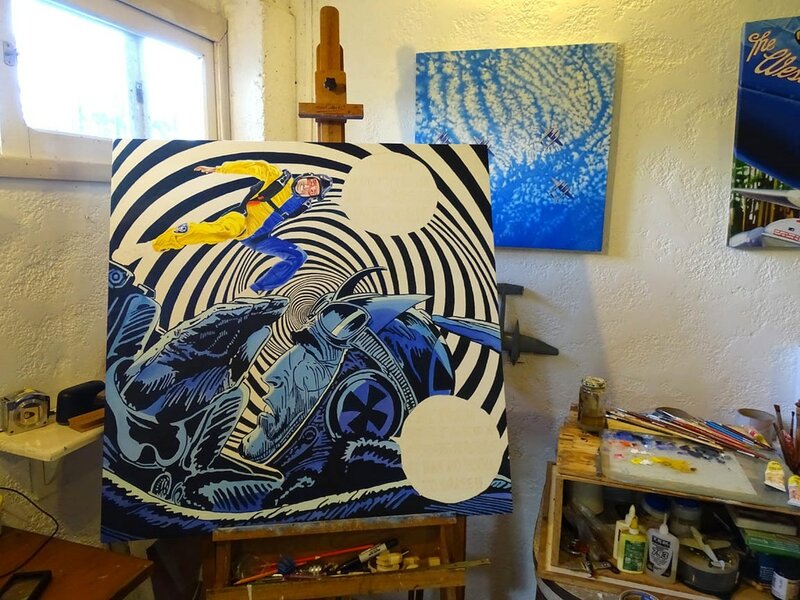 "Sobre el Palacio Lapido" is my thirteenth rotational painting but only the second rotational done in a rectangular format. 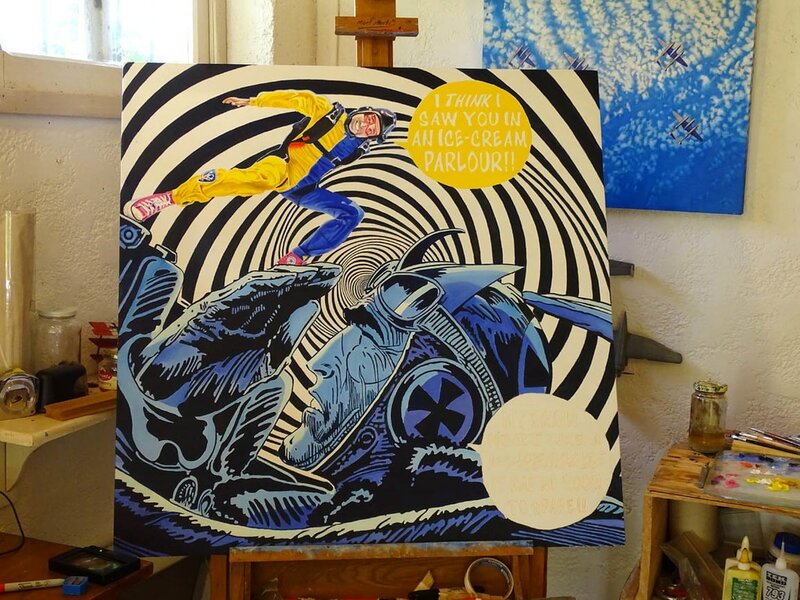 Designed to have an increasing or decreasing dizzying effect on the viewer depending upon which rotation the painting is displayed. 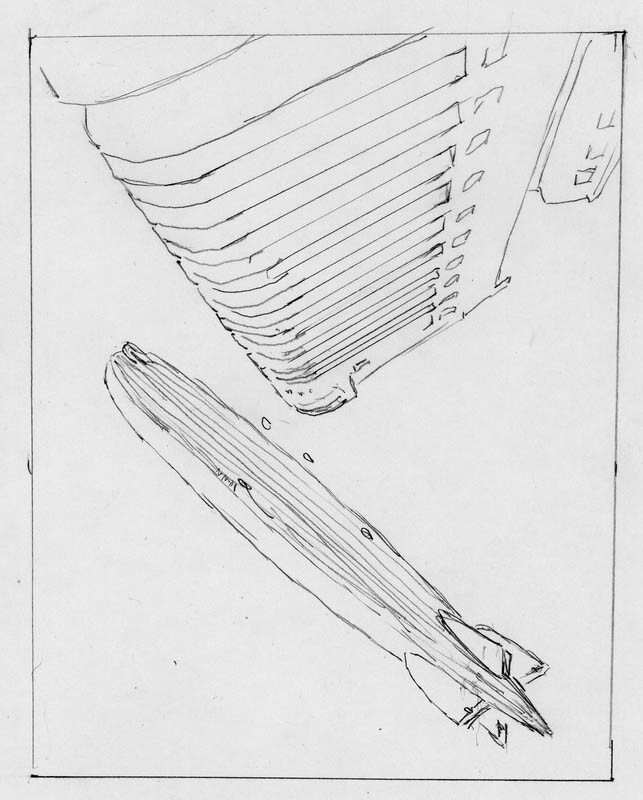 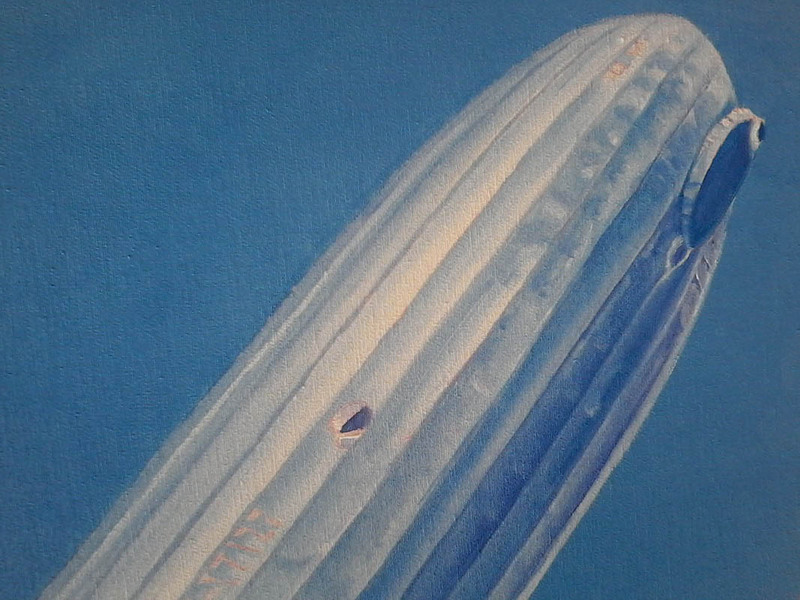 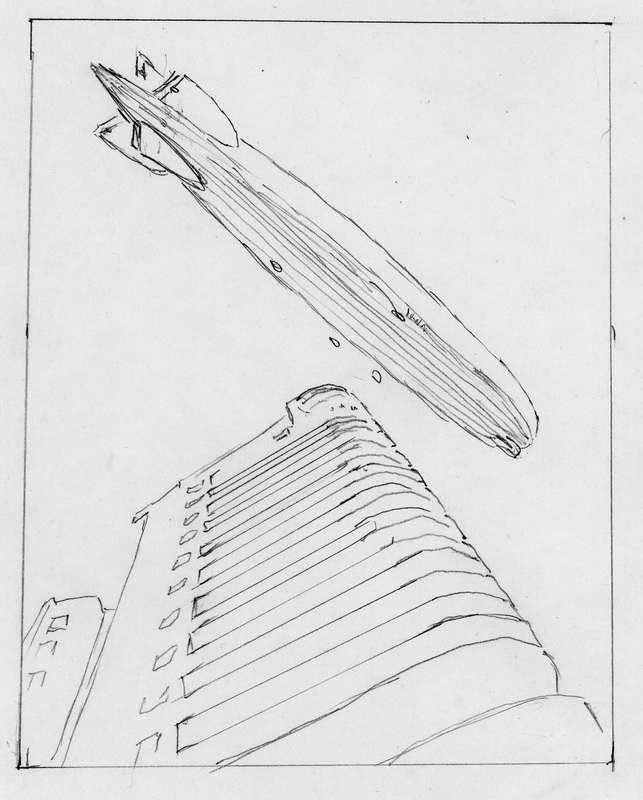 The Graf Zeppelin's visit to Montevideo in 1934 is well documented photographically. There are many photos of it over the city, Rio de la Plata and alongside Montevideo's most famous building the Palacio Salvo which is located on the corner of the Plaza Independencia. Roughly 650 feet away from Palacio Salvo along Avenida 18 de Julio stands the majestic Palacio Lapido which was completed in 1933. 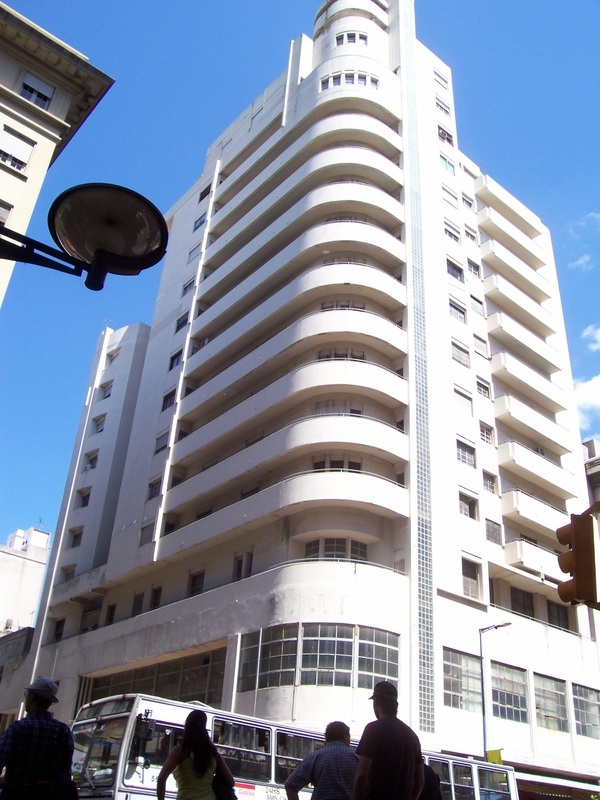 The I consider Palacio Lapido to be one of the finest examples of Art Deco architecture in South America. 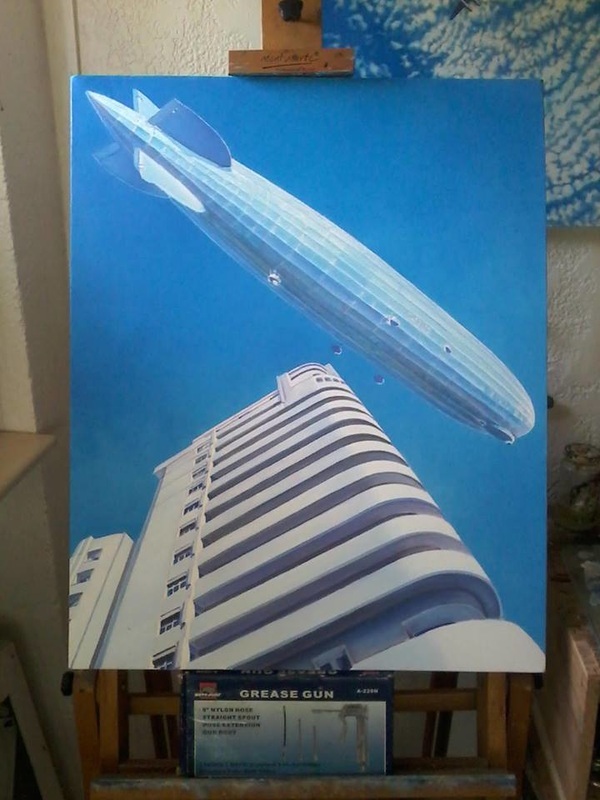 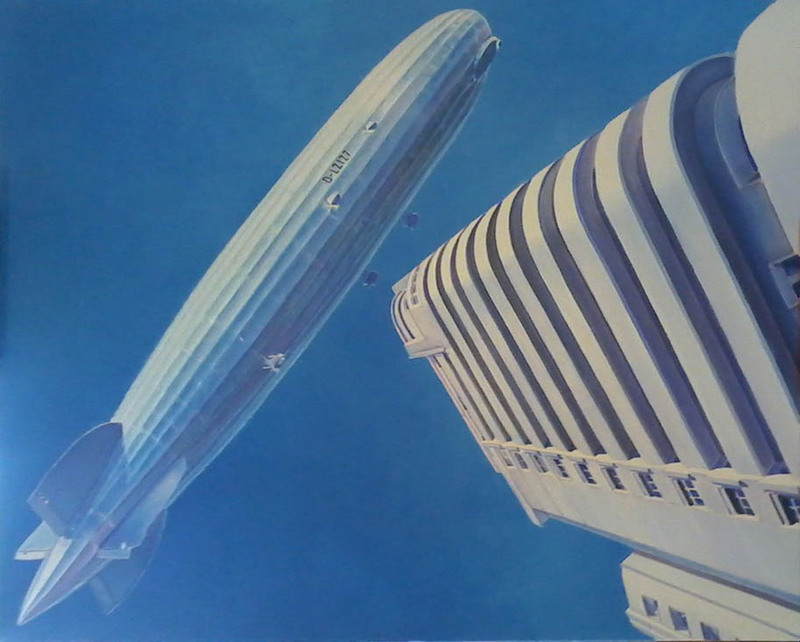 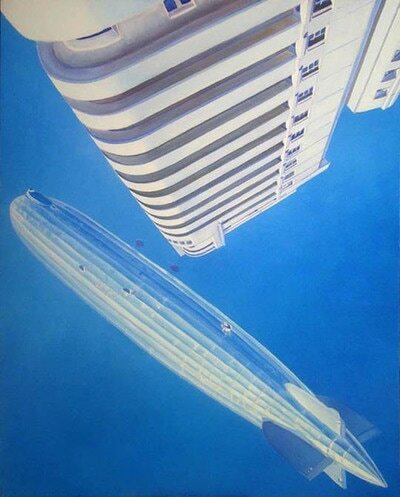 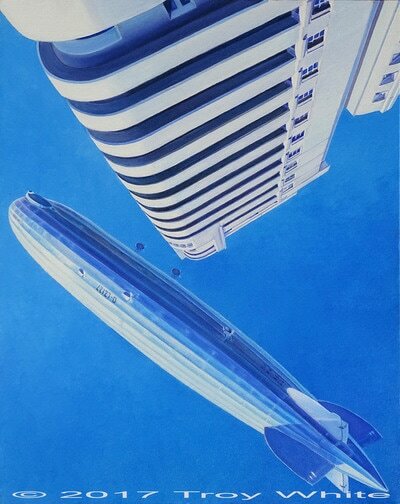 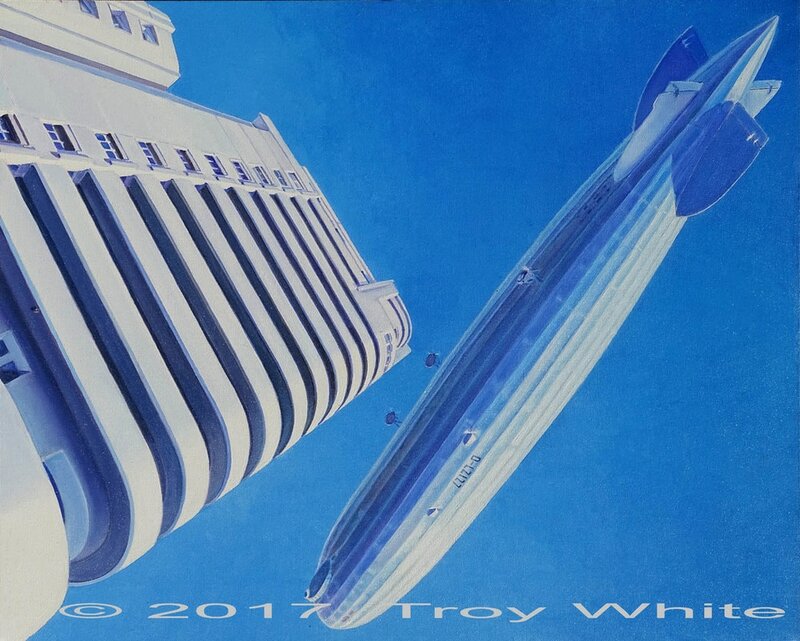 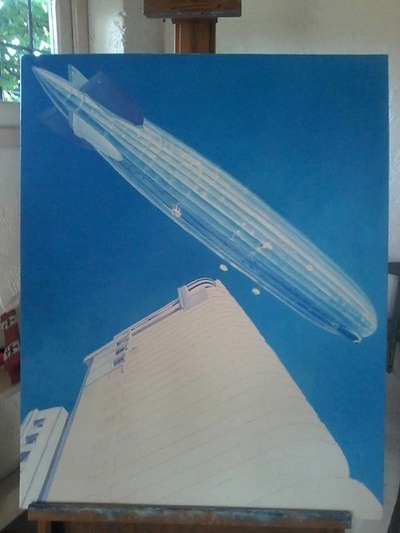 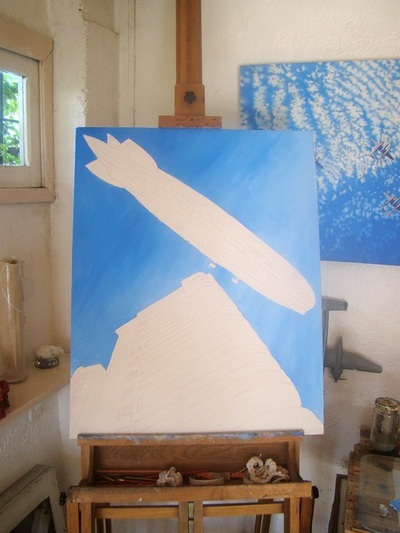 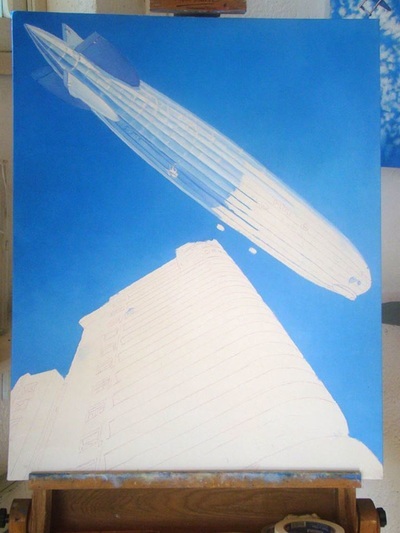 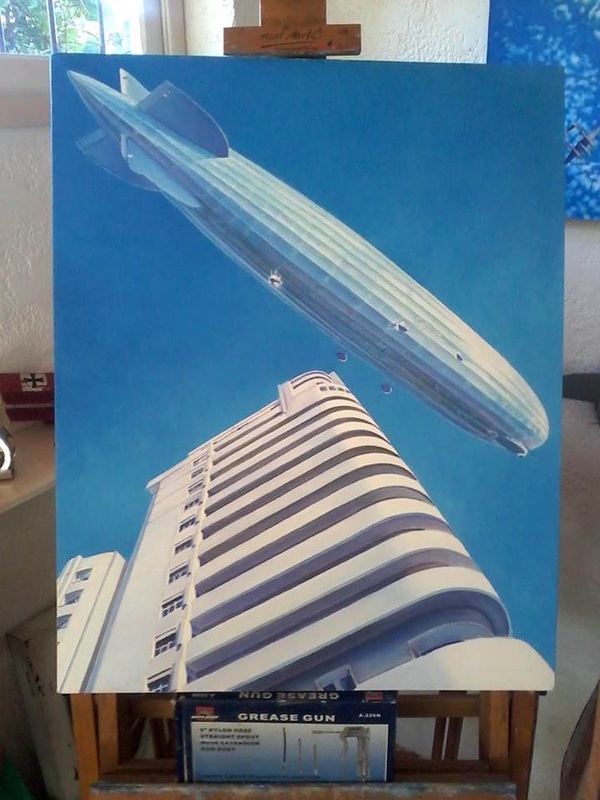 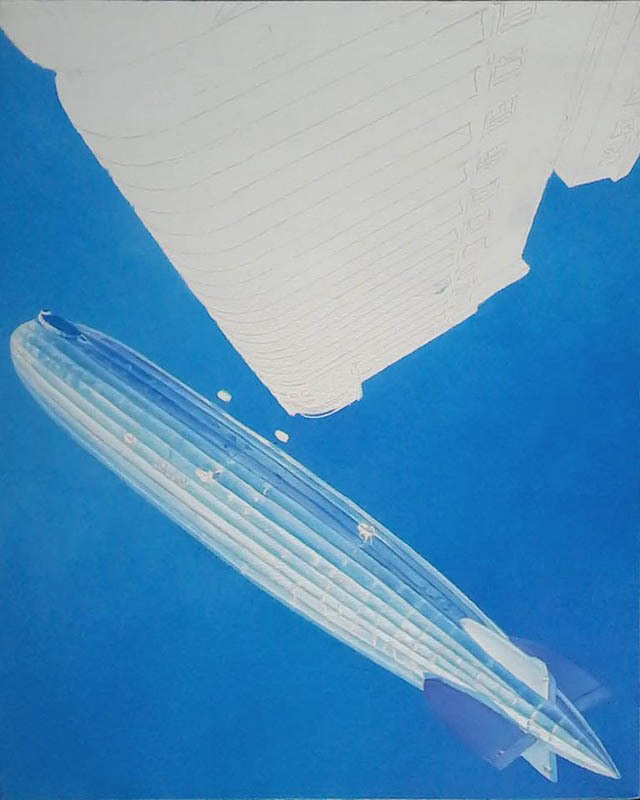 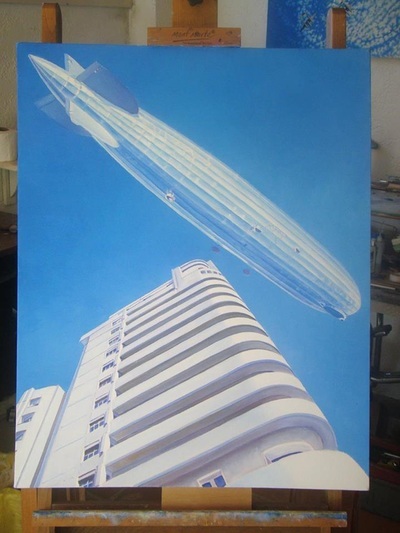 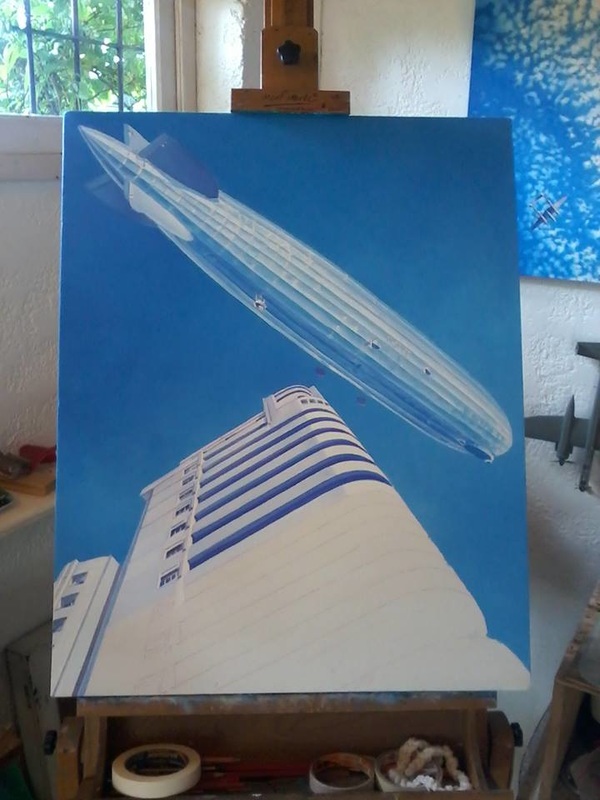 I decided to paint "Sobre el Palacio Lapido" while working on my surrealistic time warp painting of the Graf Zeppelin "Reflejo Dos - Break on Through", which was completed in 2012. 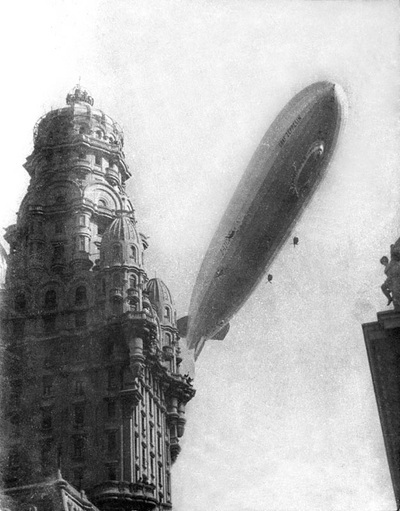 Although no photos exist of the Graf Zeppelin with the Palacio Lapido the Zeppelin was at least 125 feet longer than the distance between the two buildings and would certainly have passed over the Palacio Lapido on it's passage down 18 de Julio. 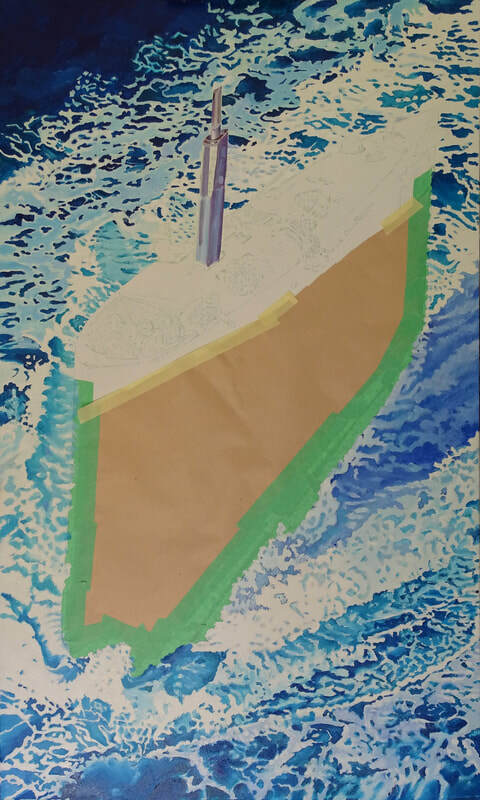 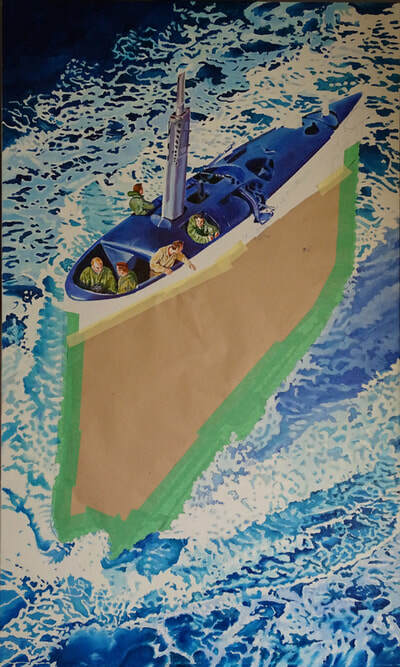 For the painting I decided on a simple, graphic composition that would rotate beautifully and effectively, keeping in mind the travel posters of the 1920s and '30s. "Sobre el Palacio Lapido" is oil on canvas and measures 24" x 30". 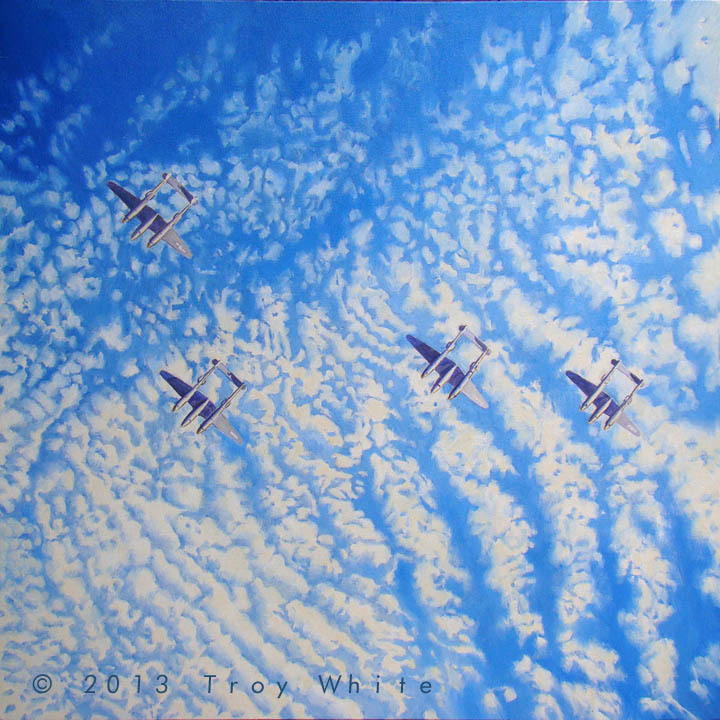 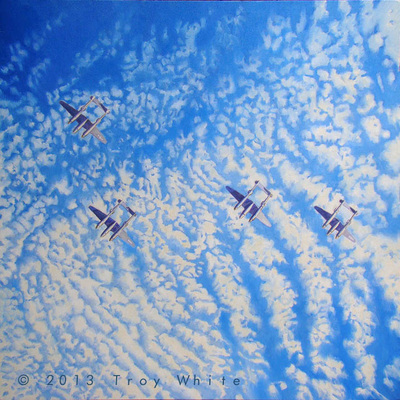 "Stardust" is going to be the final air combat painting of my career aside from commissions. 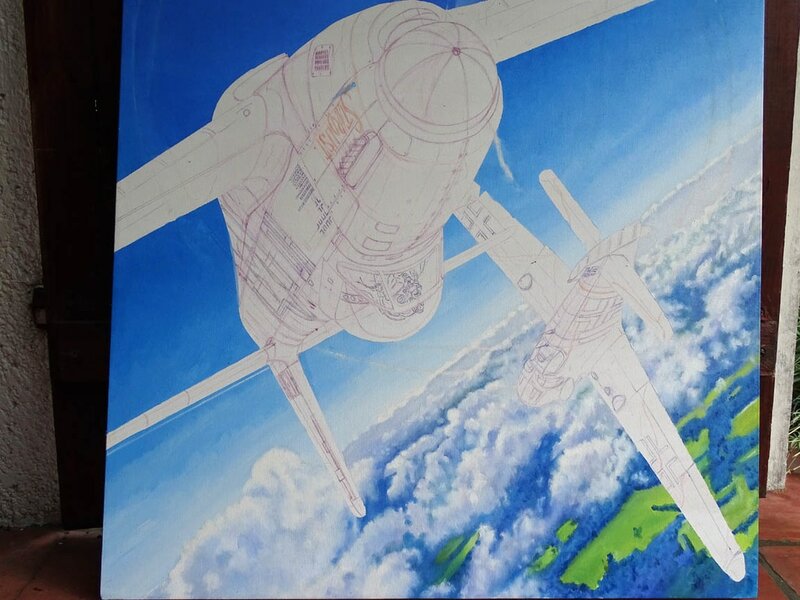 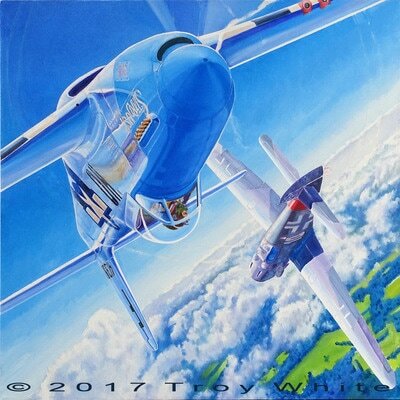 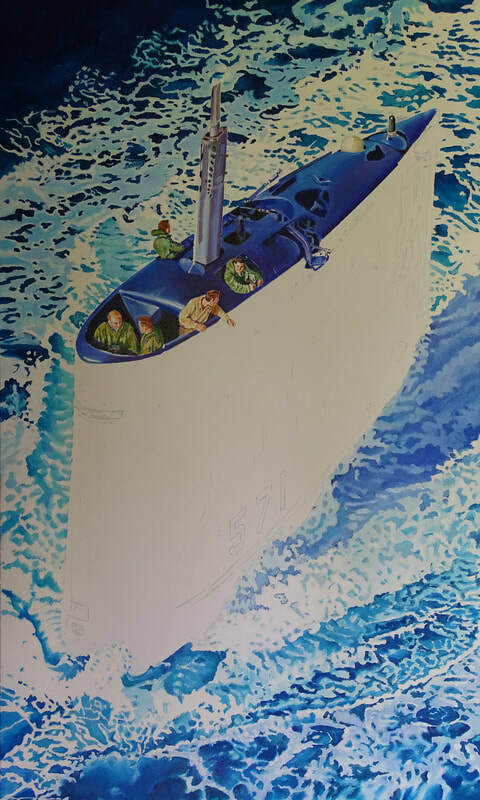 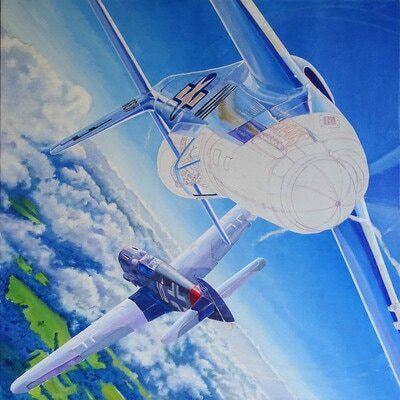 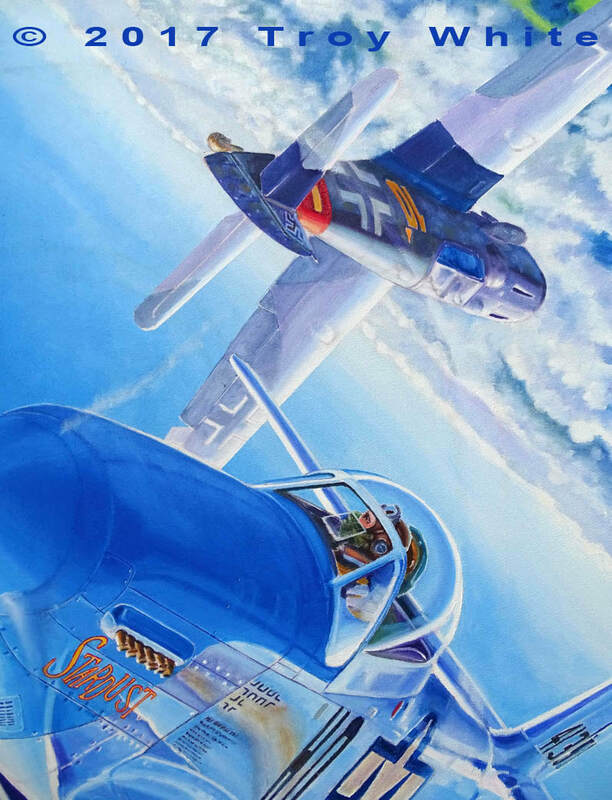 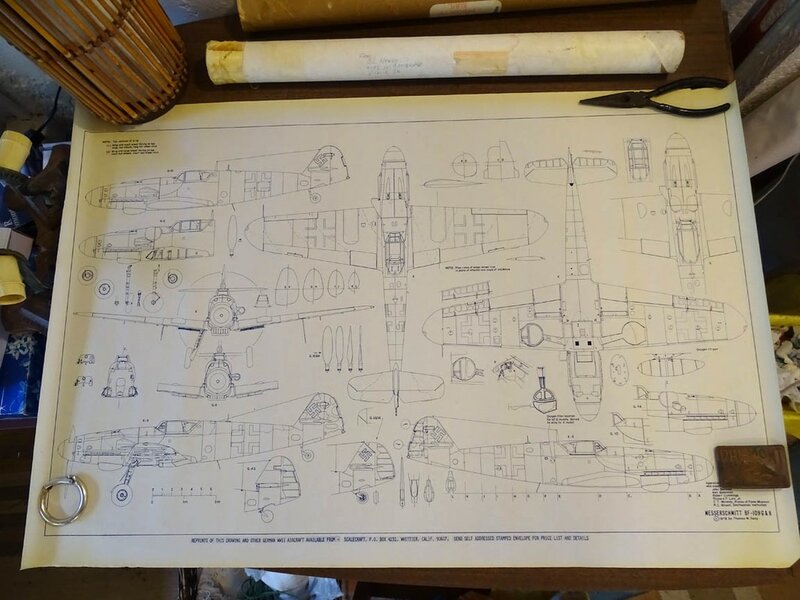 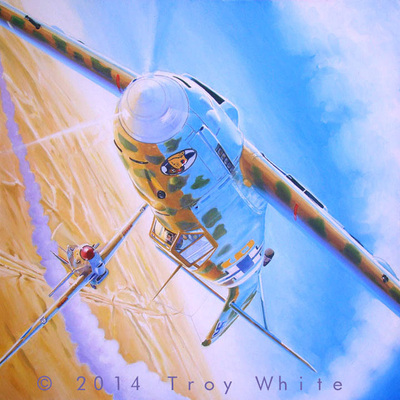 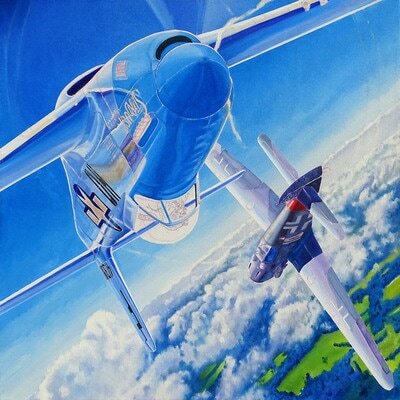 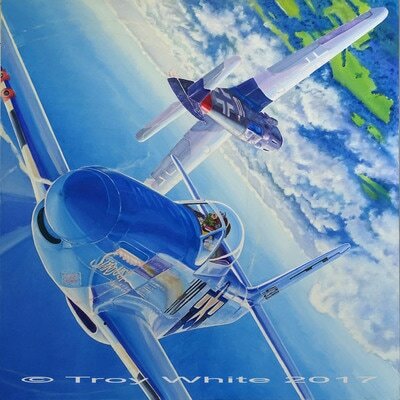 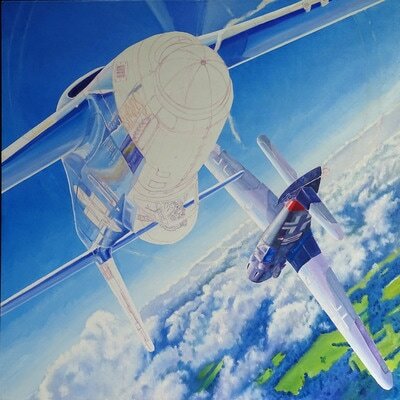 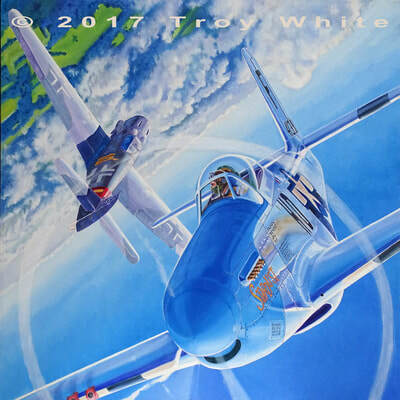 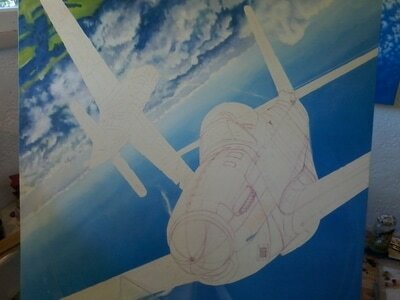 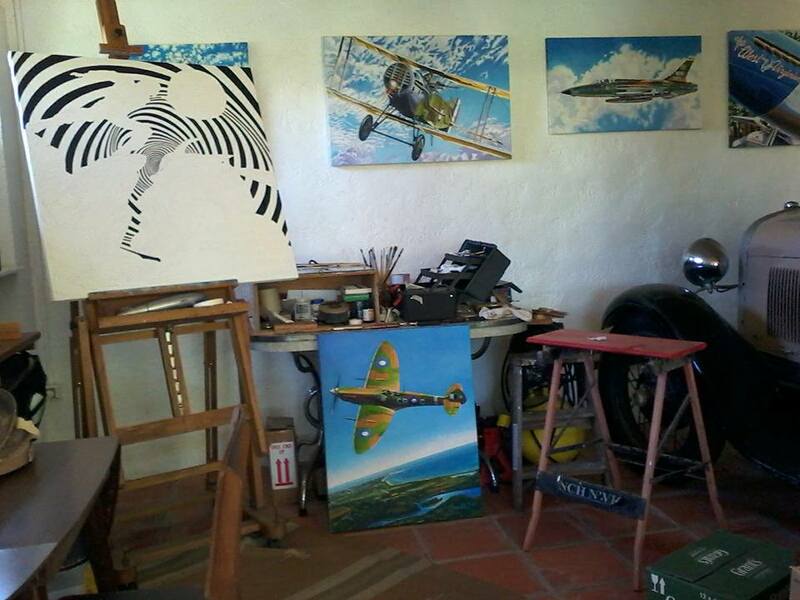 I began making military aircraft themed paintings back in 1976 and in the past 40 years I've produced more than 100 works. 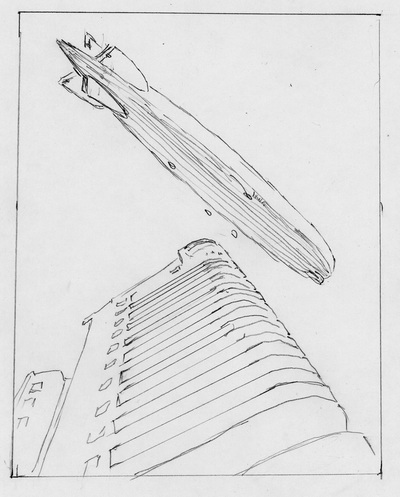 I first began to grow weary of the genre in 2003 and almost gave it up in 2004. 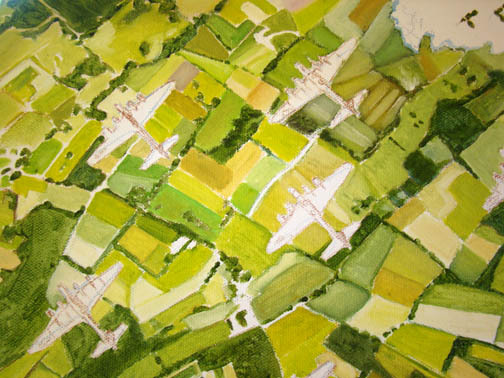 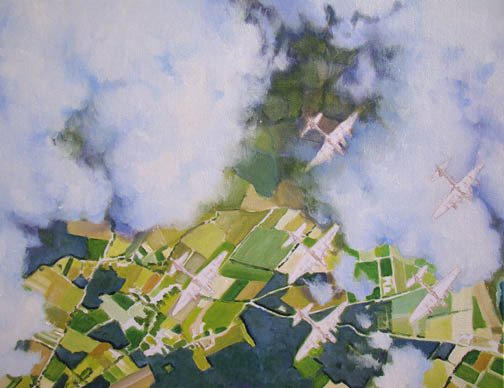 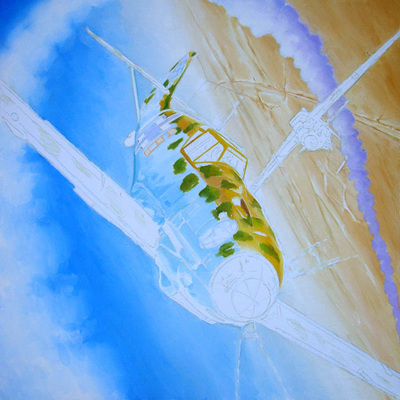 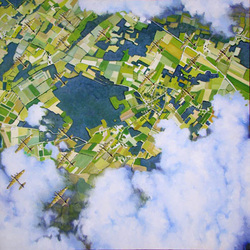 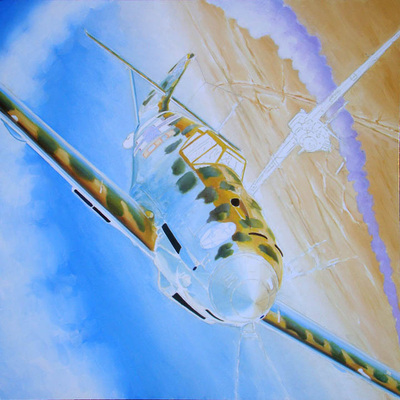 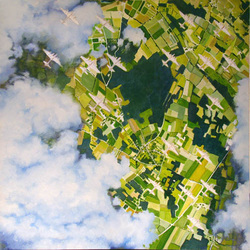 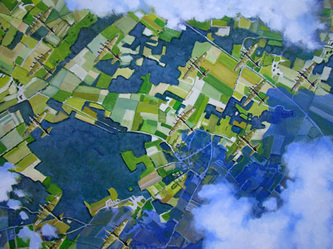 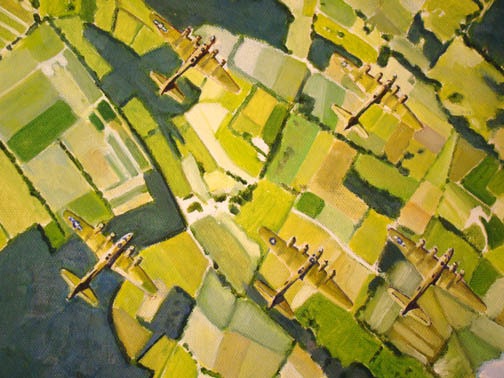 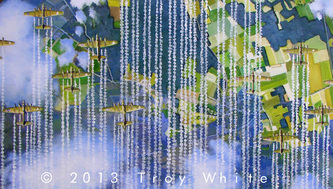 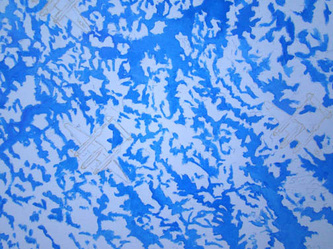 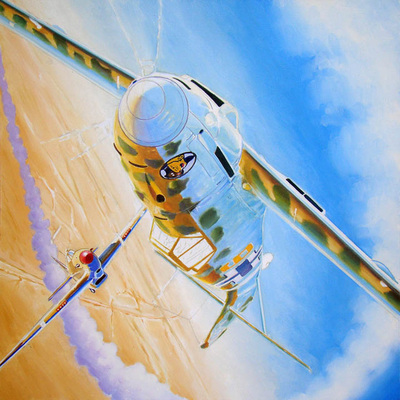 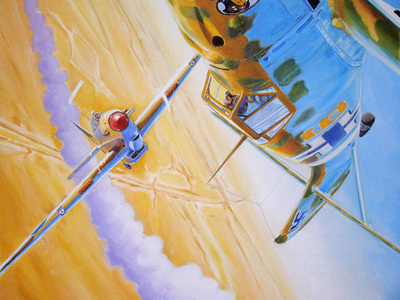 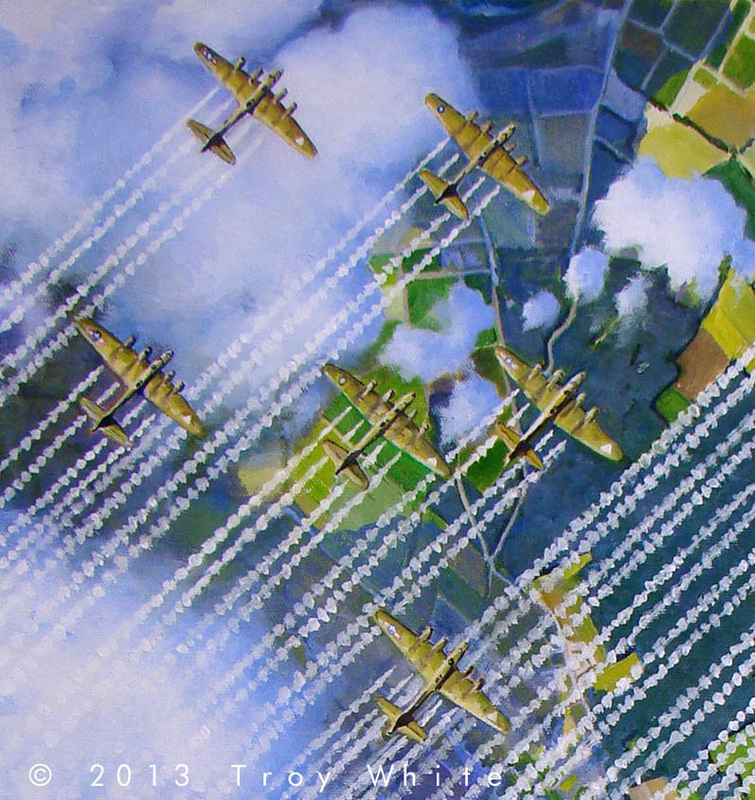 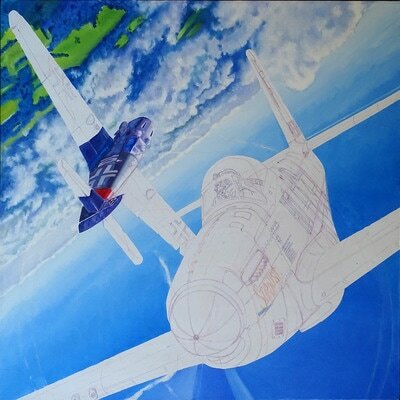 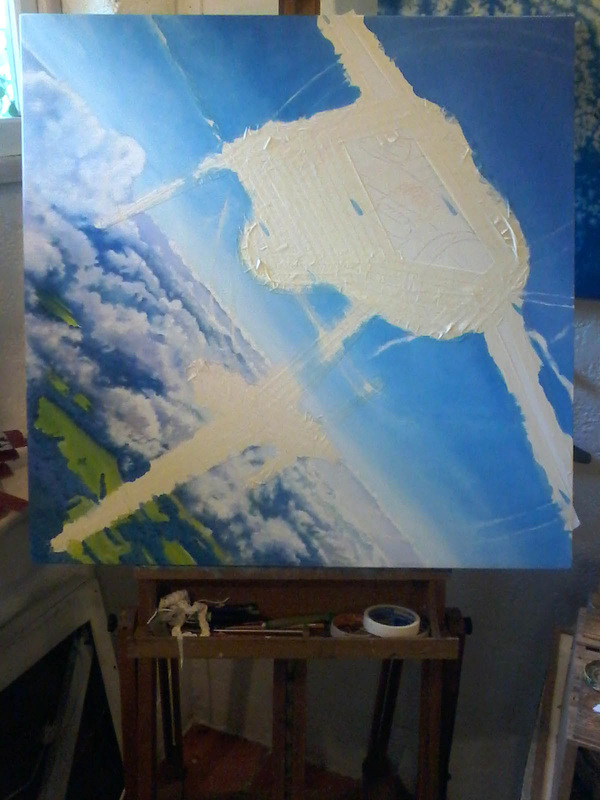 I stuck with it because I love aviation and there was always another plane or pilot, or fascinating story that I had always planned to paint but I was growing tired of the theme of war and it seemed to me that I was not doing anything unique or dynamic compositionally and had started to feel that I wasn't being challenged by the work. 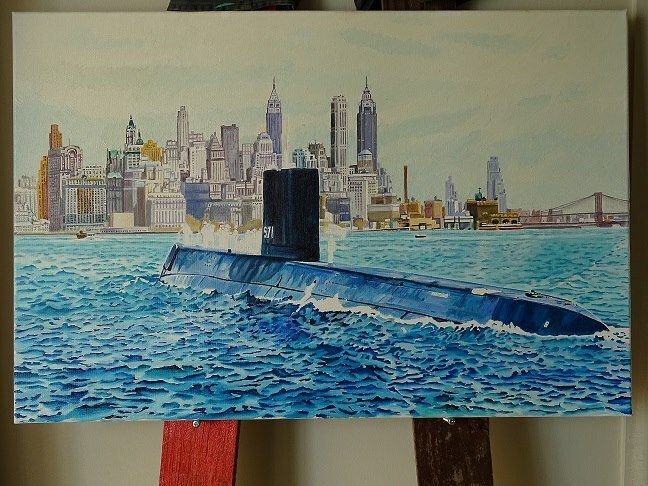 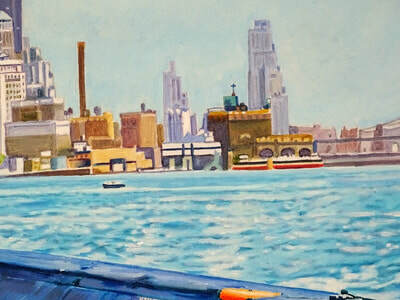 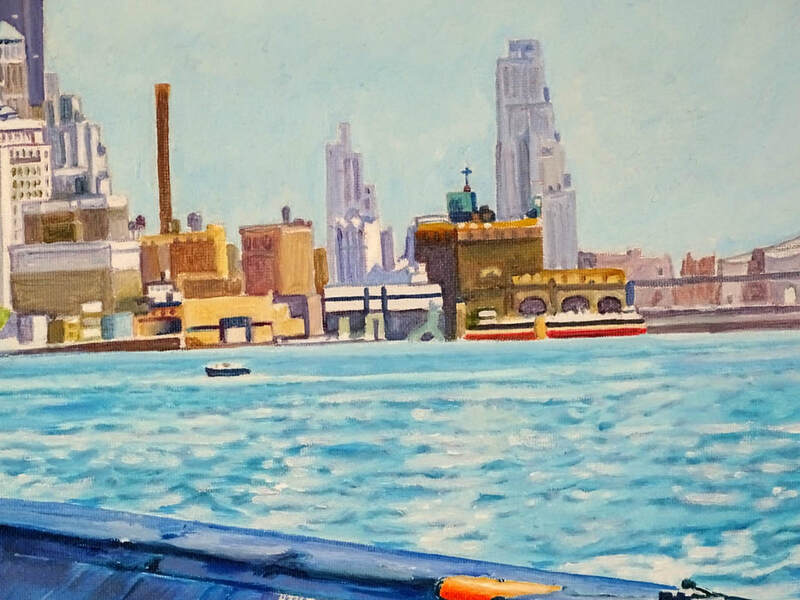 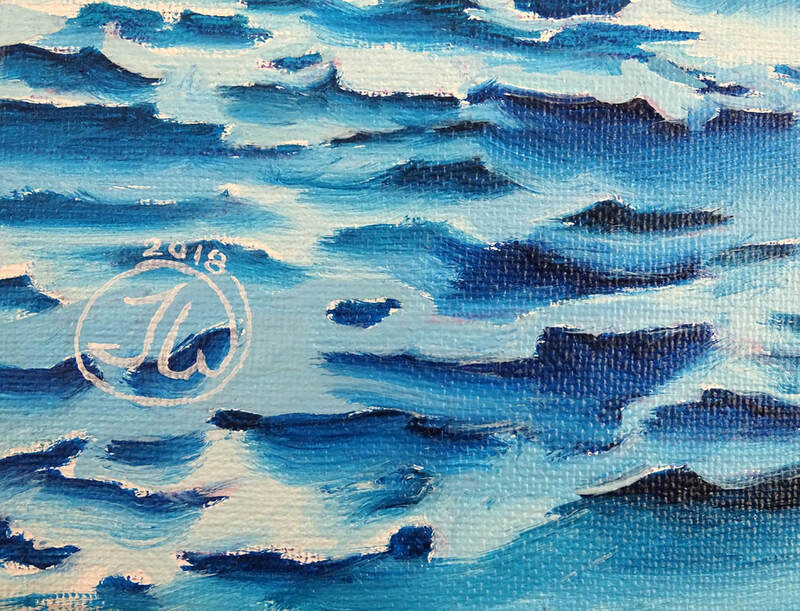 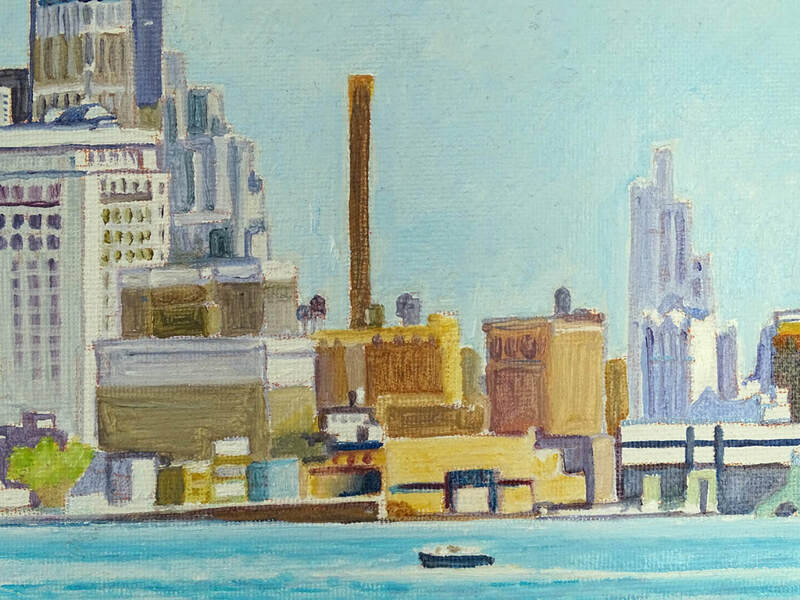 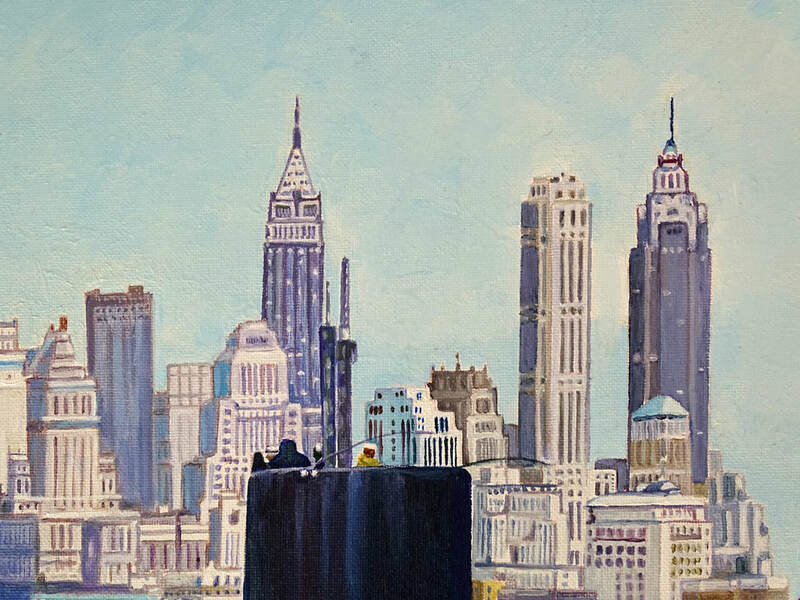 Occasionally I would paint a speculative project in the hopes that one of my collectors would be inspired to add it to their collection. 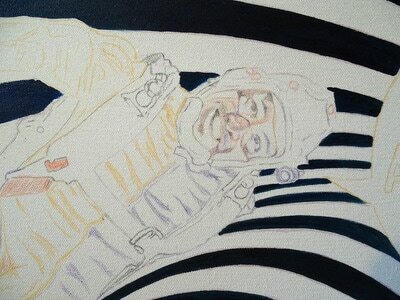 That is misguided motivation and it added to my fatigue. 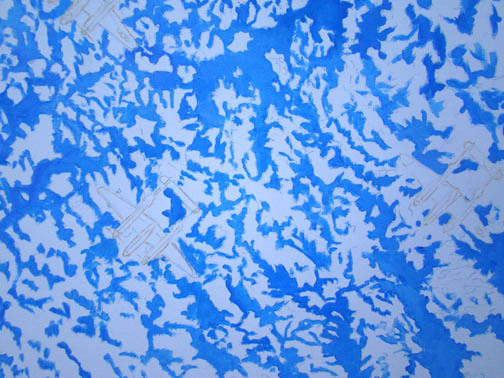 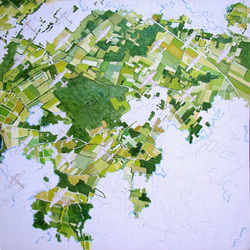 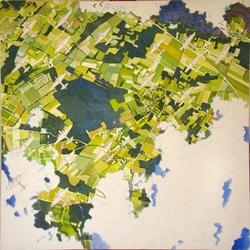 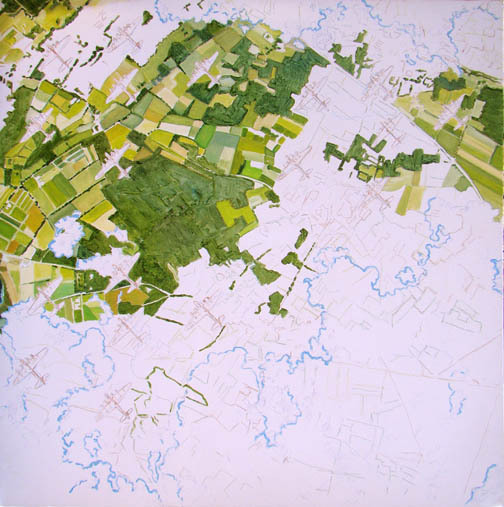 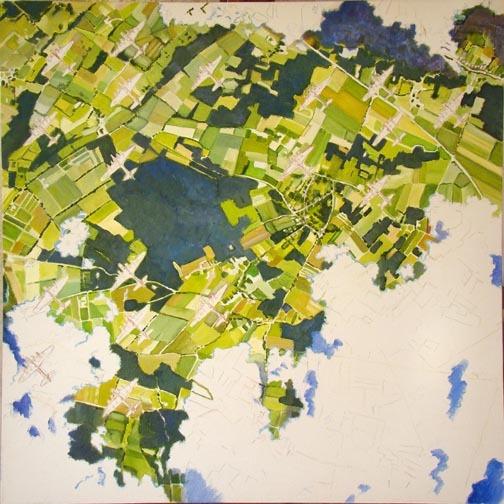 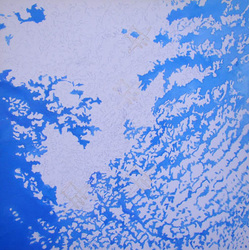 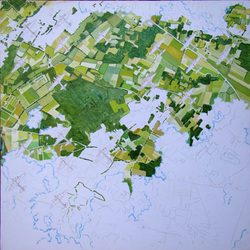 In 2007 I created a rotational painting in a lucky accident and began exploring the concept. 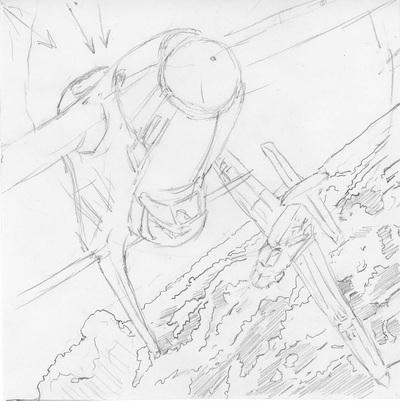 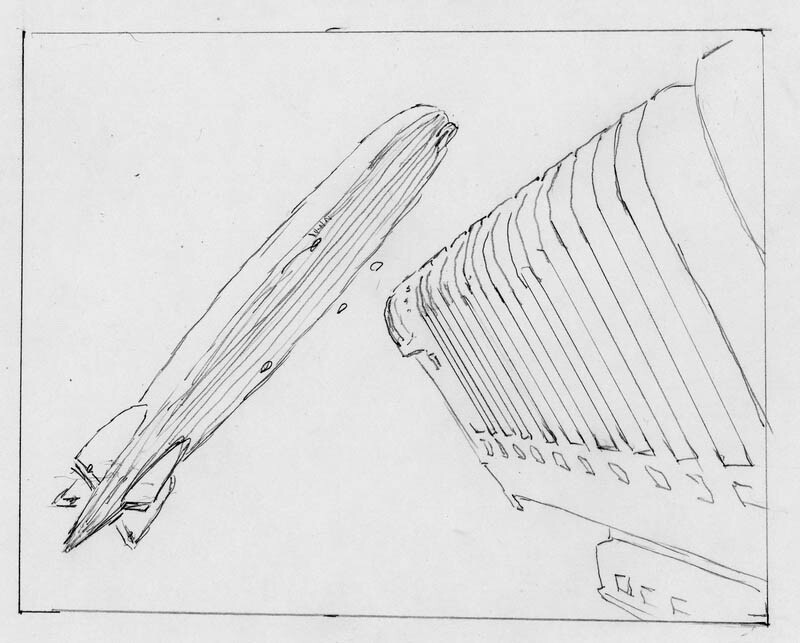 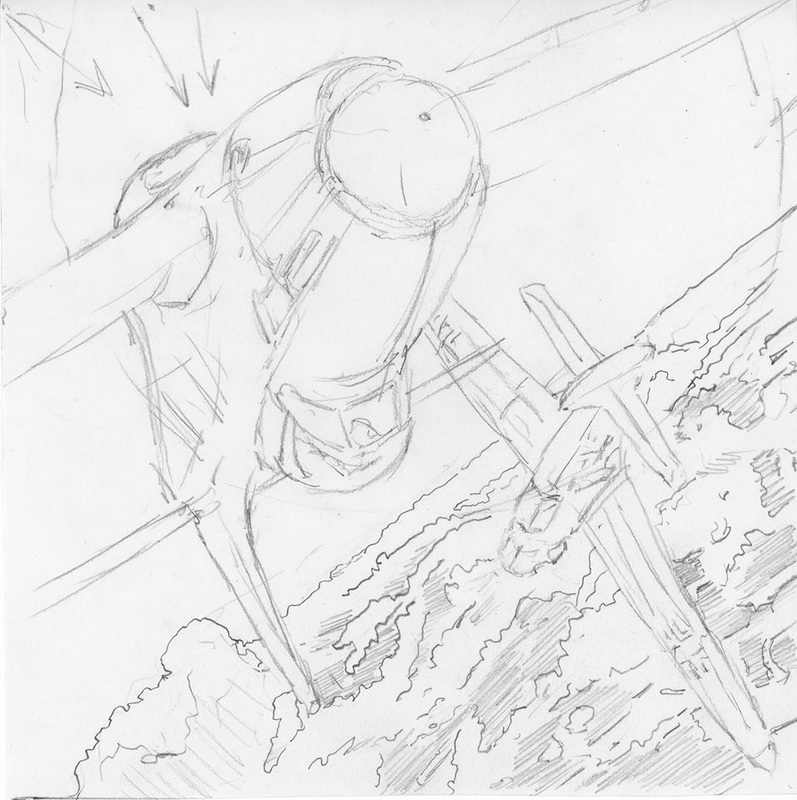 I was pretty jazzed because making a composition look good and believable in all four rotations of the canvas is a complex task and required a new set of parameters. Since then I've produced 13 rotational paintings. 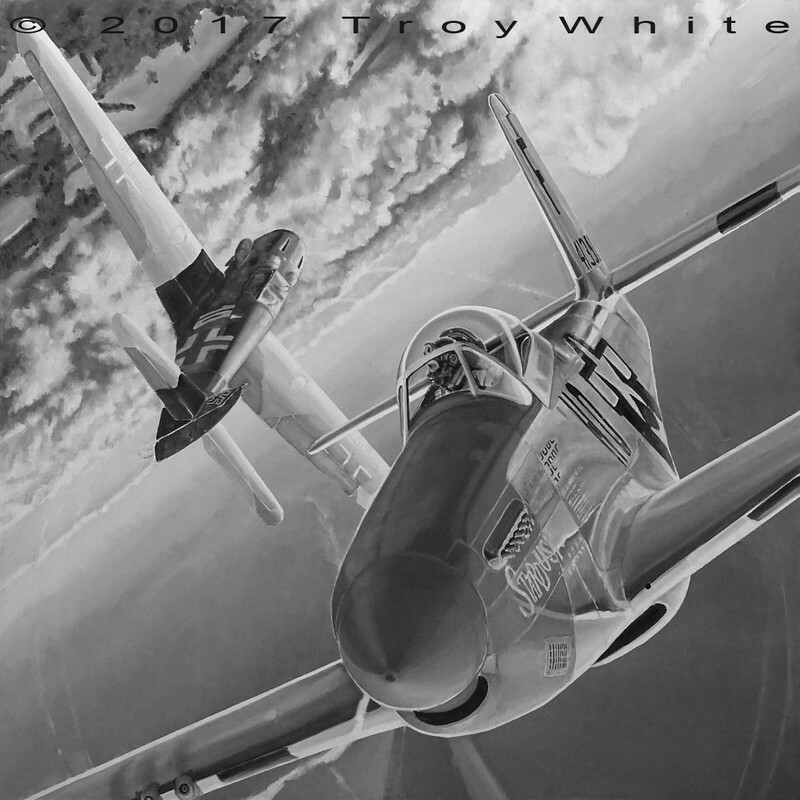 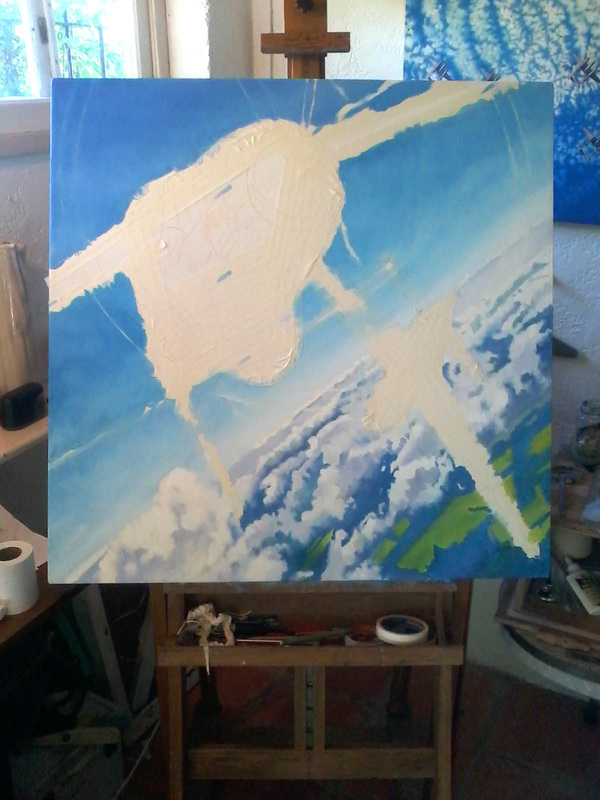 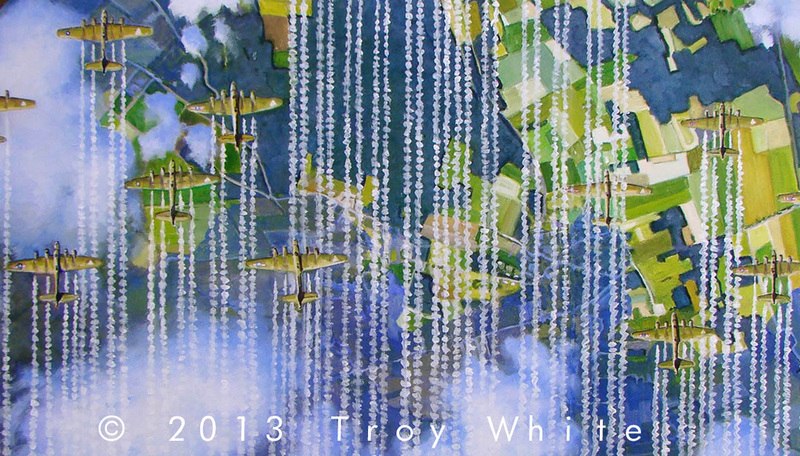 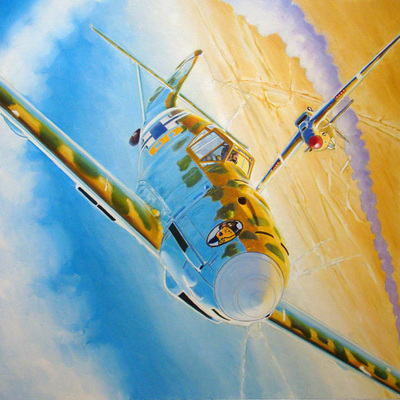 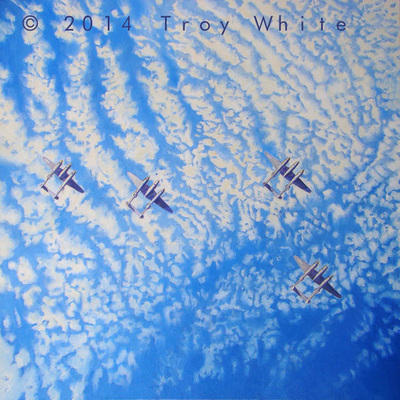 This new painting "Stardust" will be my last air combat painting. 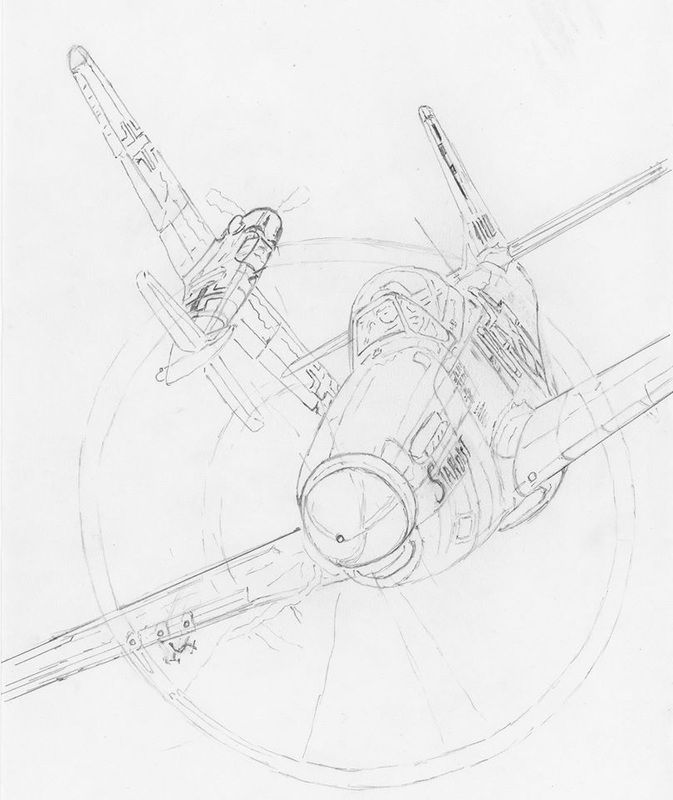 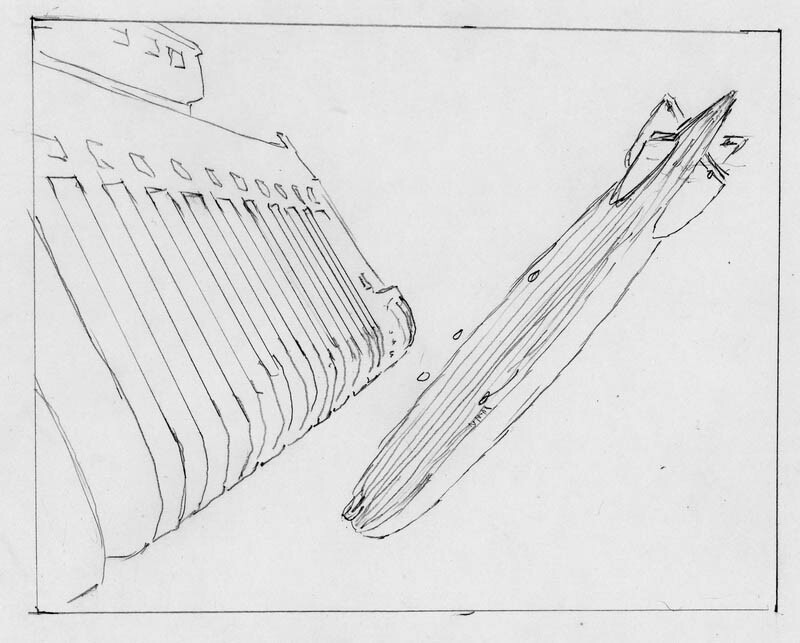 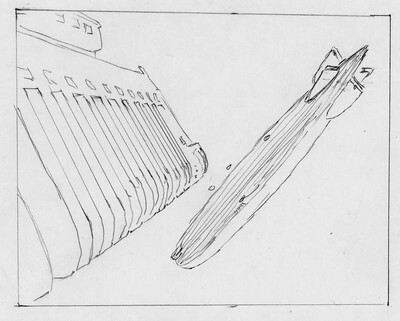 I've chosen Lt. Bill "Flaps" Flowler's P-51D-5 as my main subject. I first met Flaps in 1996 at a 352nd FG reunion in Savannah, Georgia shortly after starting Stardust Studios. 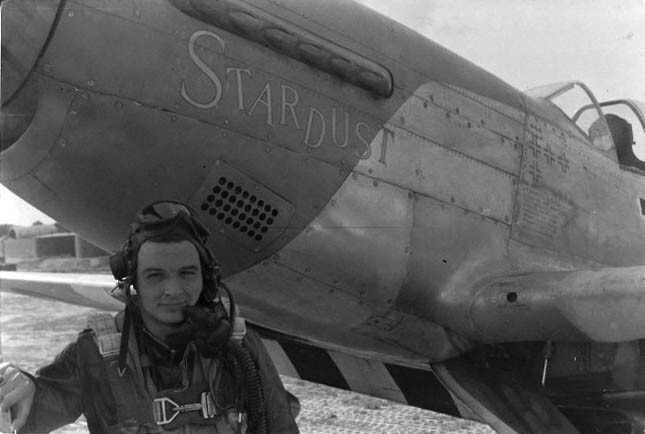 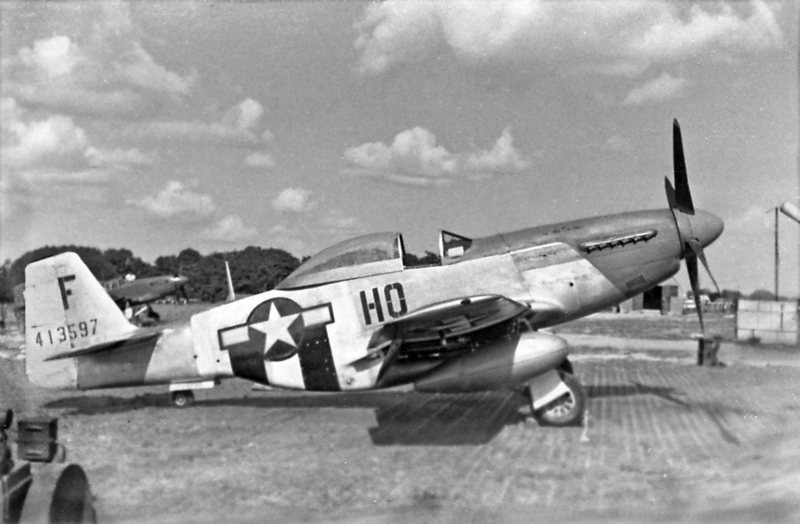 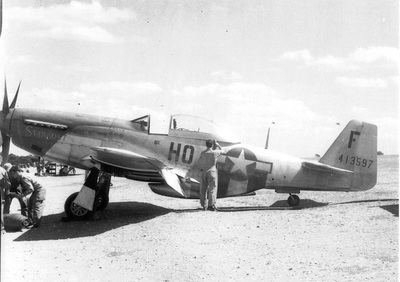 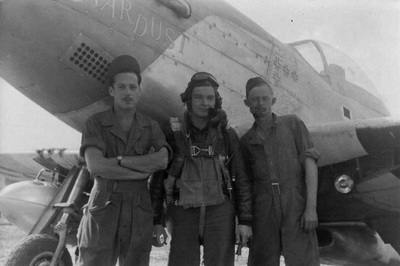 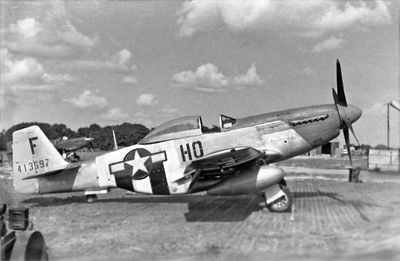 Flaps flew with the Group's 487th Fighter Squadron. I really took a shine to Flaps and decided I wanted to paint his Mustang. I never thought it would take 20 years to get around to it. 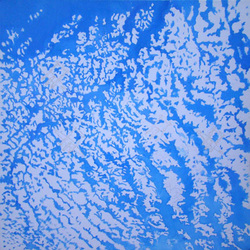 "Stardust" measures 90 x 90 cm. Recently I became aware of two aerial battles, one on 23 April 1941 and one on 31 May 1941 during which Hans-Joachim Marseille was shot down while flying a Bf 109E-7 by Hawker Hurricanes. 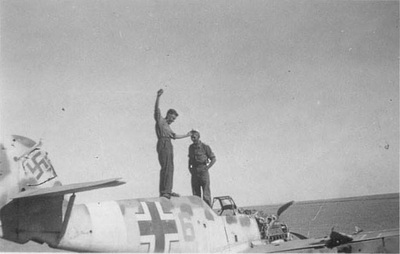 Marseille eventually became the Luftwaffe's top scoring pilot of the Mediterranean Theater. 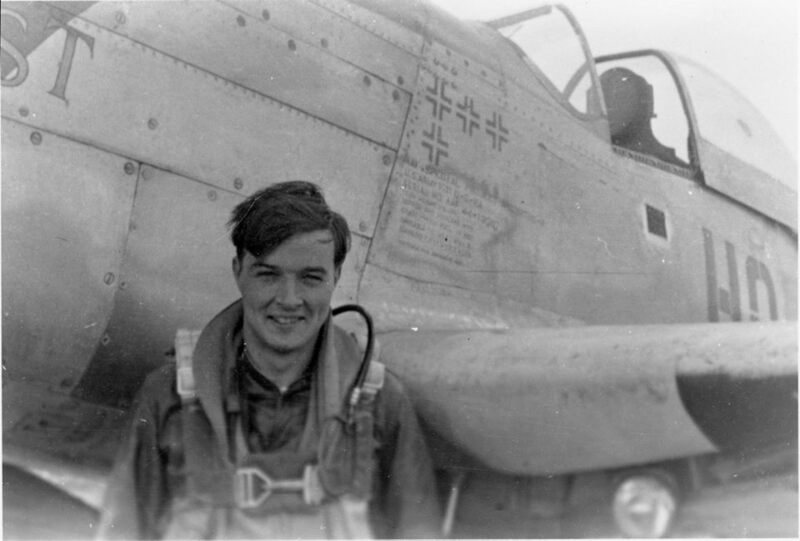 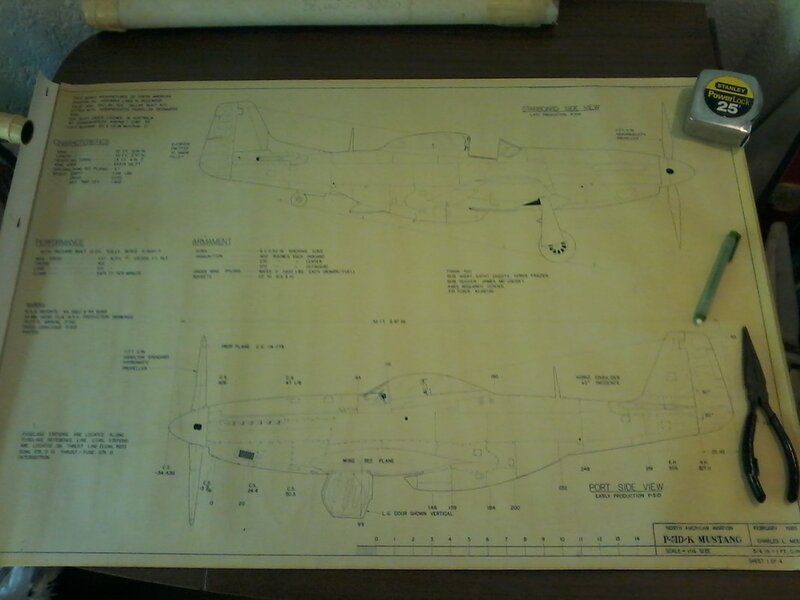 At that time the 21 year old Marseille had scored only eight victories of the eventual 158 he would chalk up against the British before being killed in a botched attempt to bail out of his brand new Bf 109G-2 in September 1942. Thanks to historian and Bf 109 expert Lynn Ritger, I have an excellent idea of what the Messerschmitt that Marseille was flying during that time period looked like. 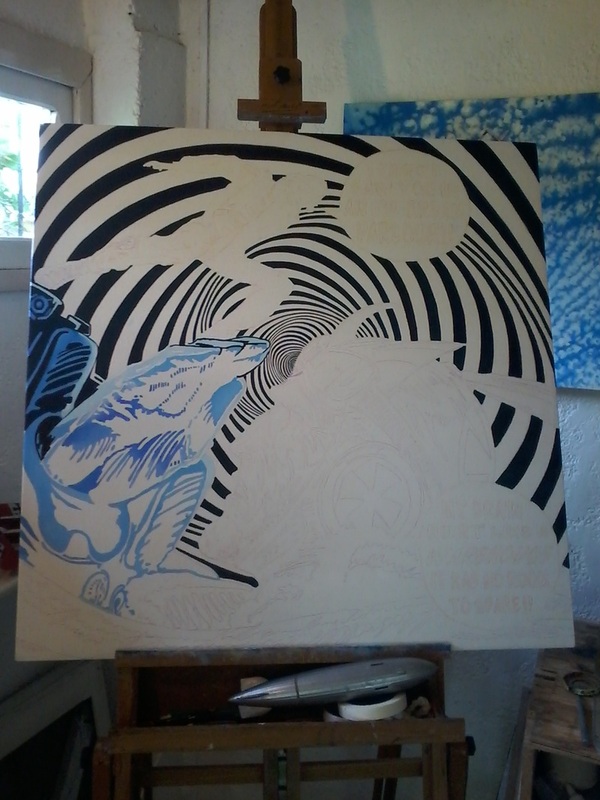 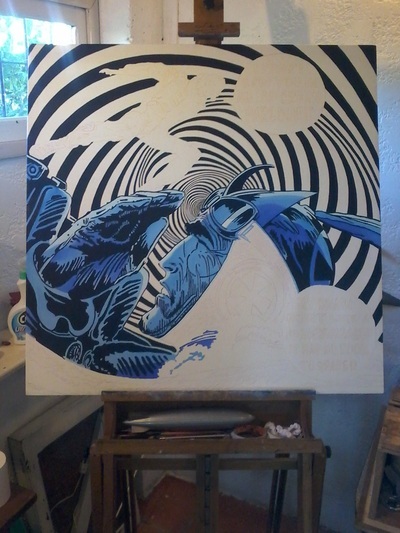 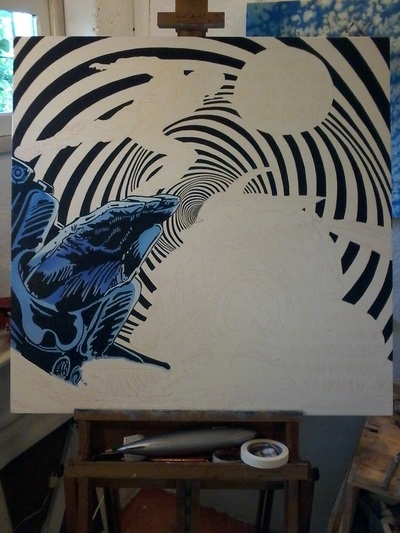 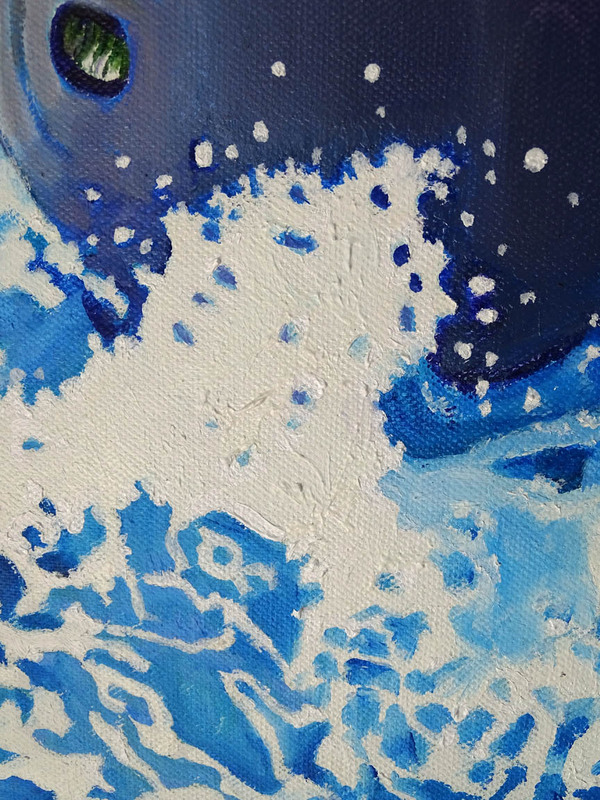 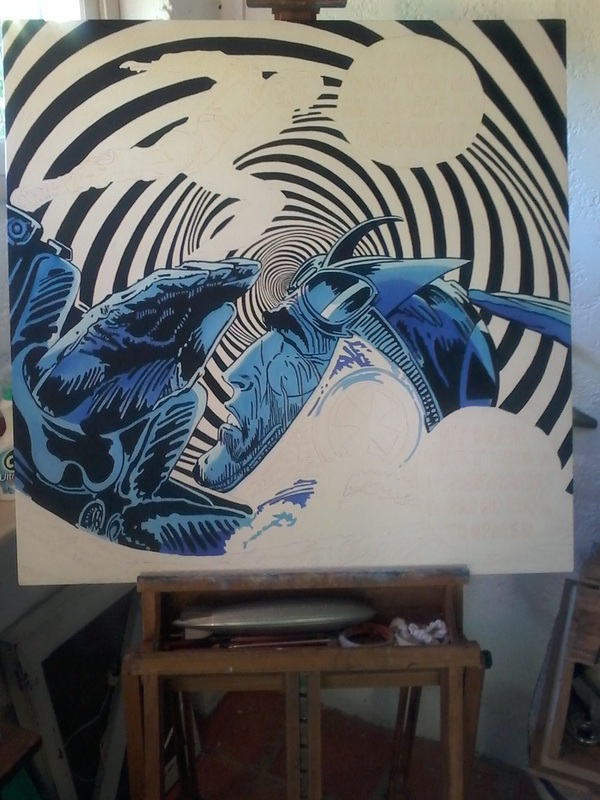 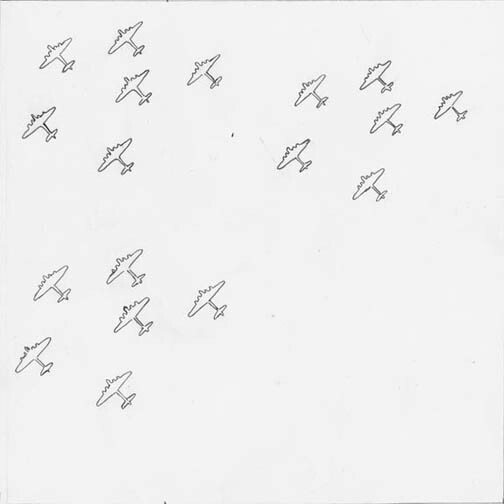 This painting will be done on a square format canvas and will be rotational on all eight square and diamond points. I'll be presenting the project on this page as it unfolds from start to completion so be sure to check back to see how it is going. This is a companion painting to "Before The Fall". 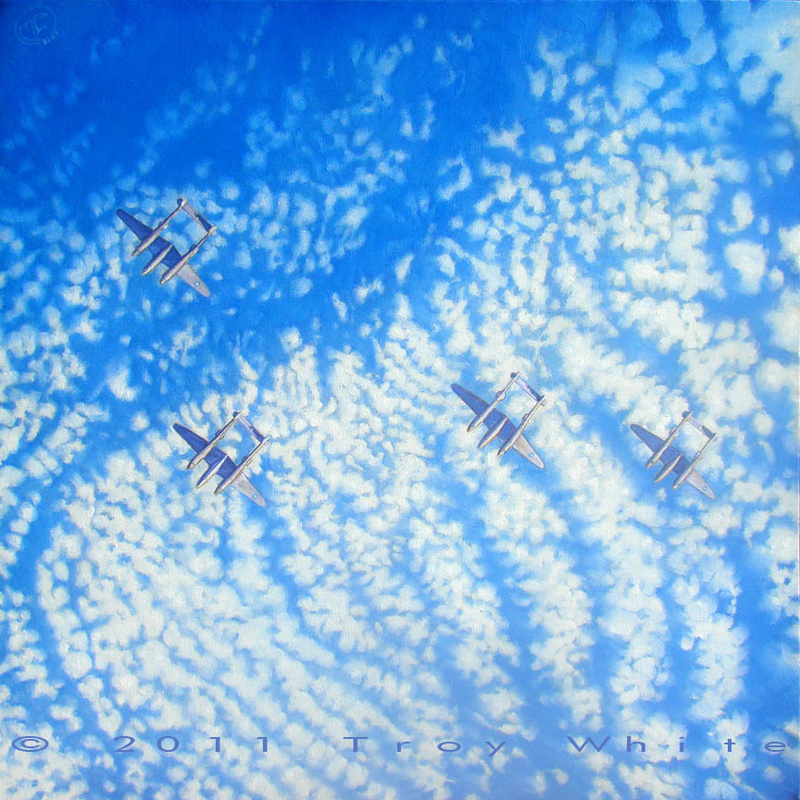 It features a flight of P-38 Lightnings viewed from directly below against a backdrop of Stratocumulus clouds. 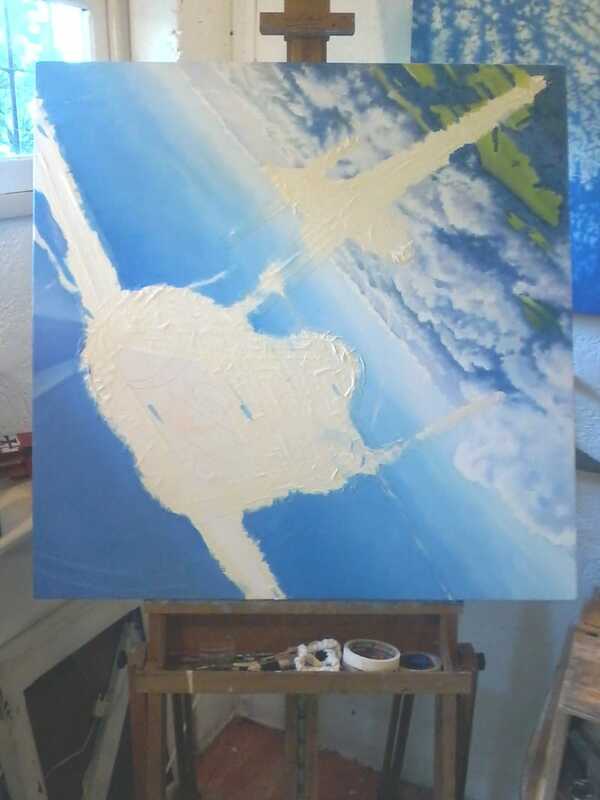 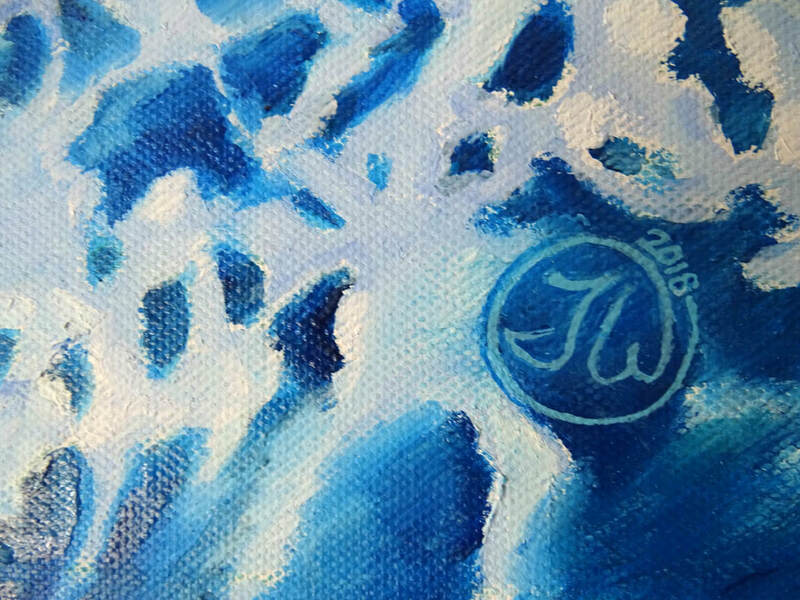 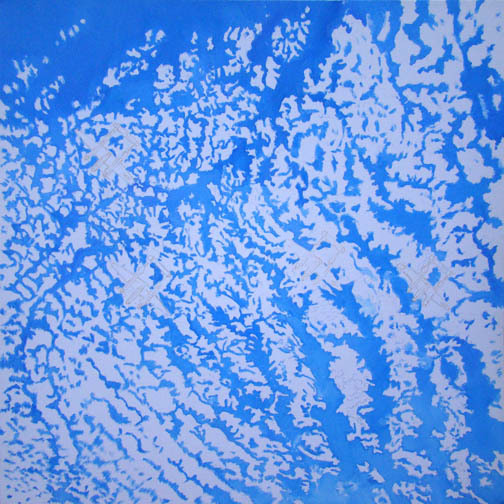 With this project I want to continue to explore the textural properties of the clouds against the blue sky as I have with previous projects like "Azul Vivo" 2012, "Dora Dazed" 2012 and "Sod Off"2010. 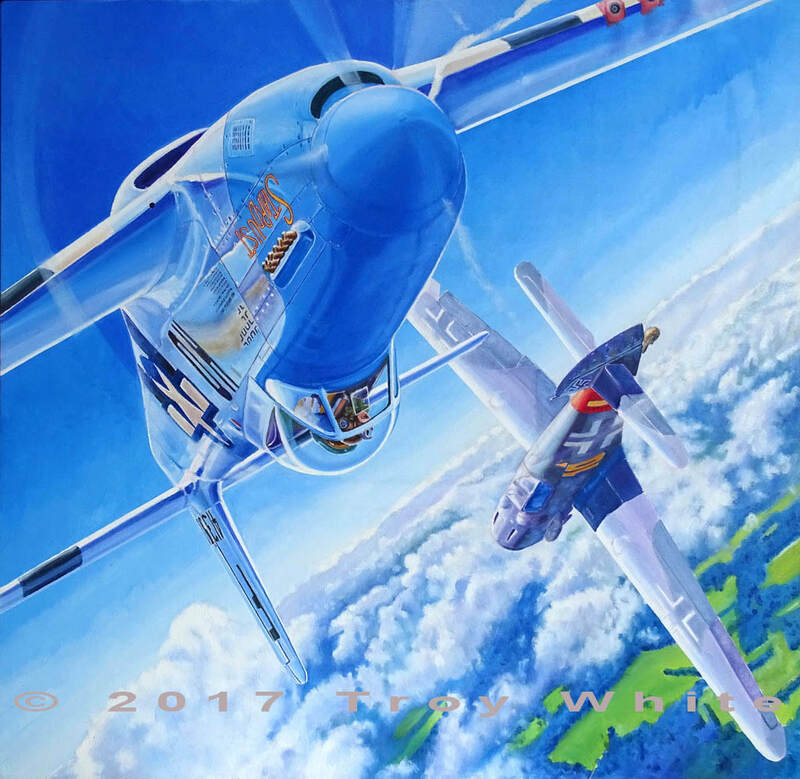 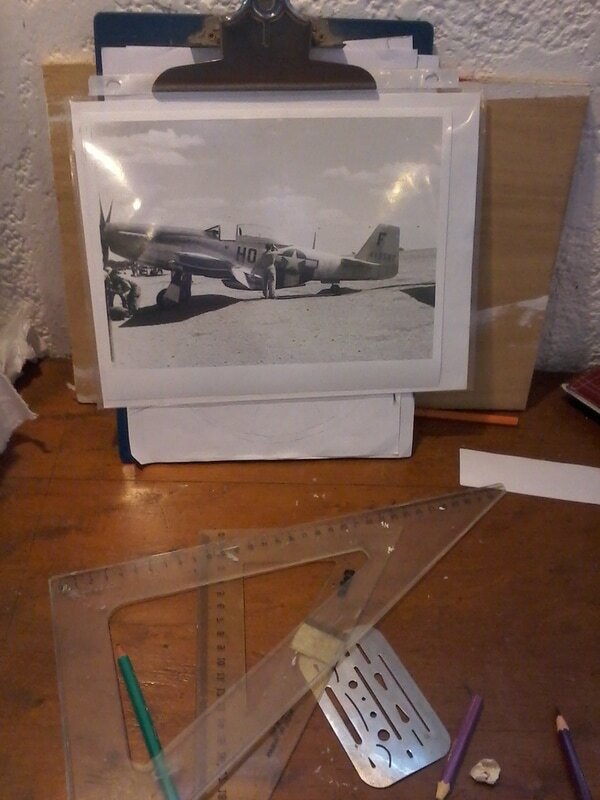 In this one I have chosen the P-38 for its distinctive, iconic shape that is distinctly American. 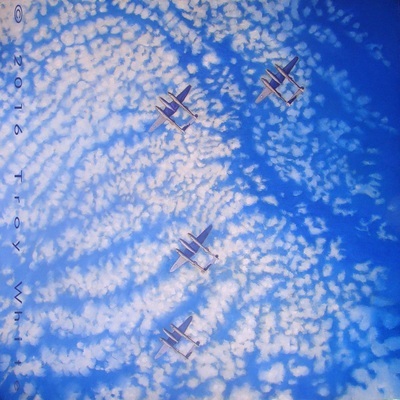 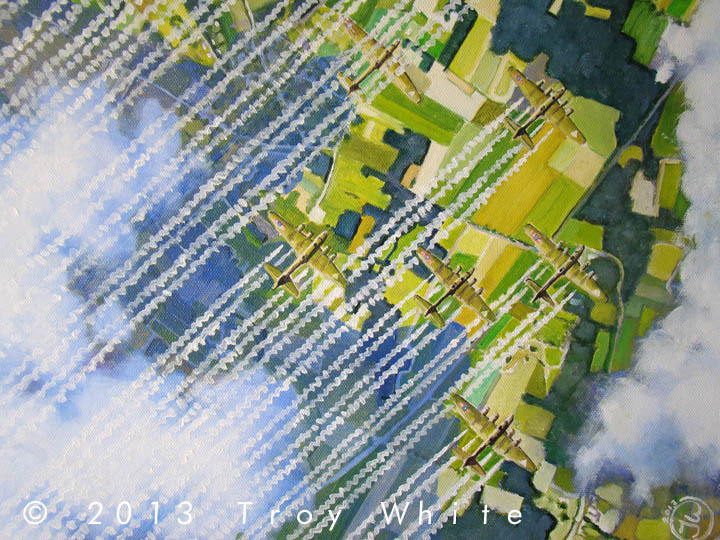 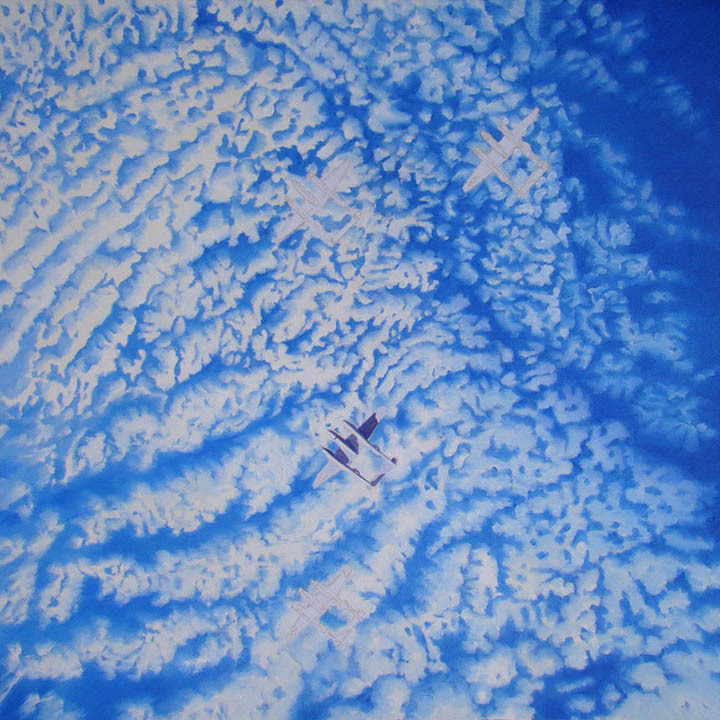 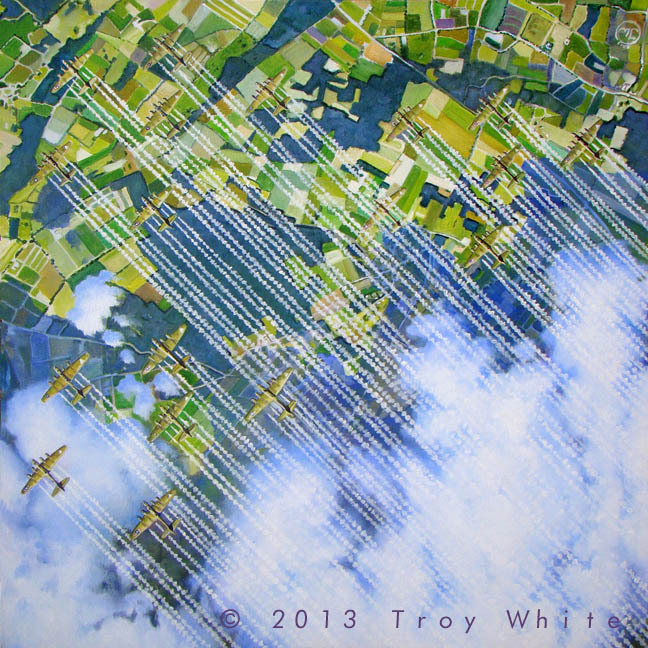 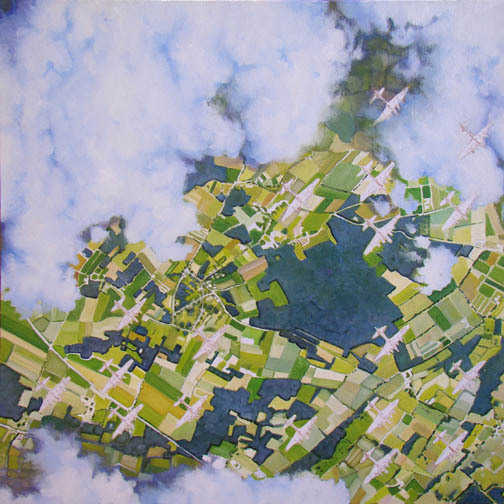 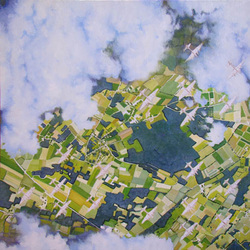 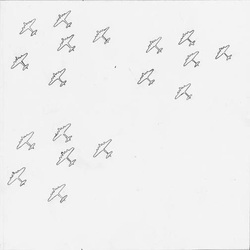 In both "Lightning in the Sky" and "Before the Fall" the patterns of the formations of aircraft interplay with the patterns of the sky, clouds and earth. 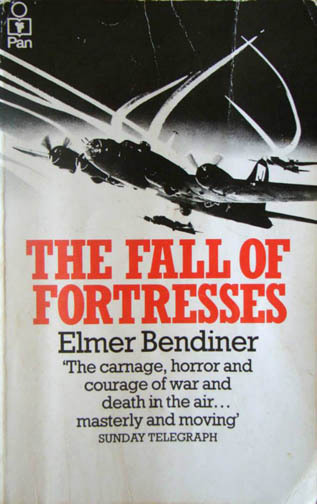 Back in 2006 I bought a second-hand copy of The Fall of Fortresses, Elmer Bendiner's autobiographical account of his tour as a B-17navigator in the US Eighth Air Force during 1943. In the book, Bendiner dissects the costly raids on the Schweinfurt ball bearing factories in southern Germany. 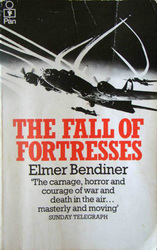 The Fall of Fortresses is considered by many to be one of the best written and most moving pieces of literature to emerge from the war. That the Schweinfurt ball bearing works became a high priority target was the result of a chance meeting at a Washington D.C. cocktail party on the evening of 20 December 1942. 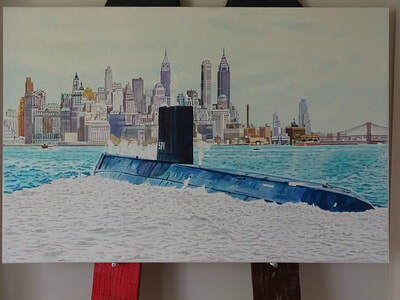 The party was at the home of the Swedish diplomatic envoy. 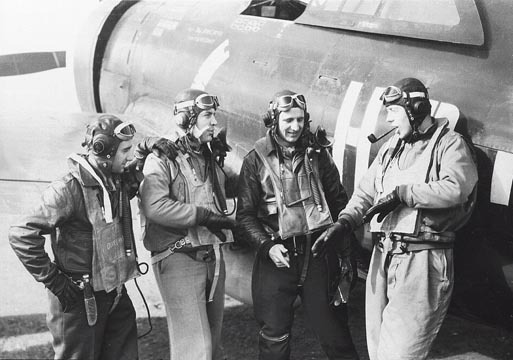 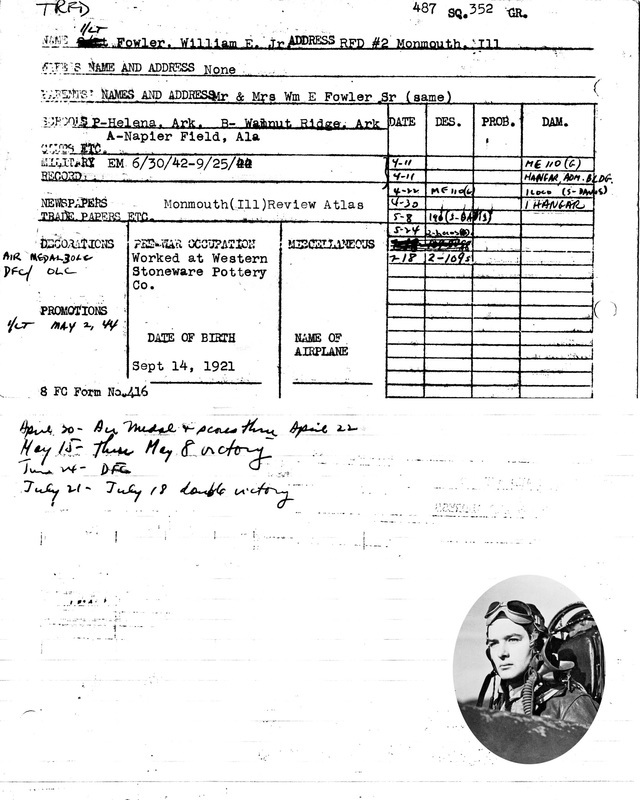 In attendance were Colonel Guido Perera, a USAAF Intelligence officer who had just been assigned to a committee that was tasked to nominate German targets for American bombers, and the Swedish Envoy's son-in-law Sexton Wolmar. Wolmar was a vice president of the American subsidiary S.K.F which produced most of the ball bearings for the United States. 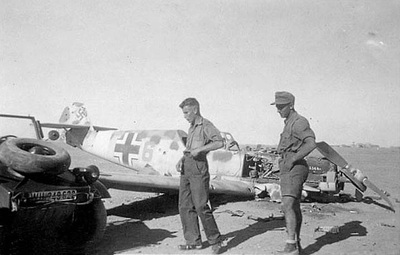 Wolmar suggested to Perera that if Hitler's ball bearing production was knocked out, the Nazi war machine would grind to a halt. 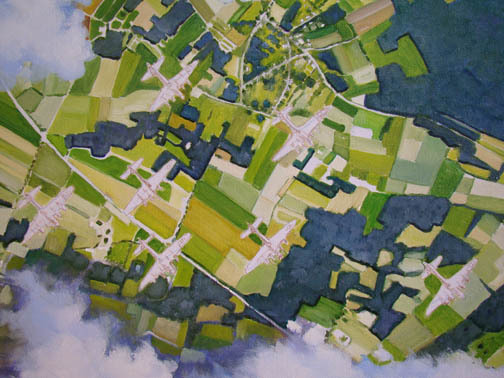 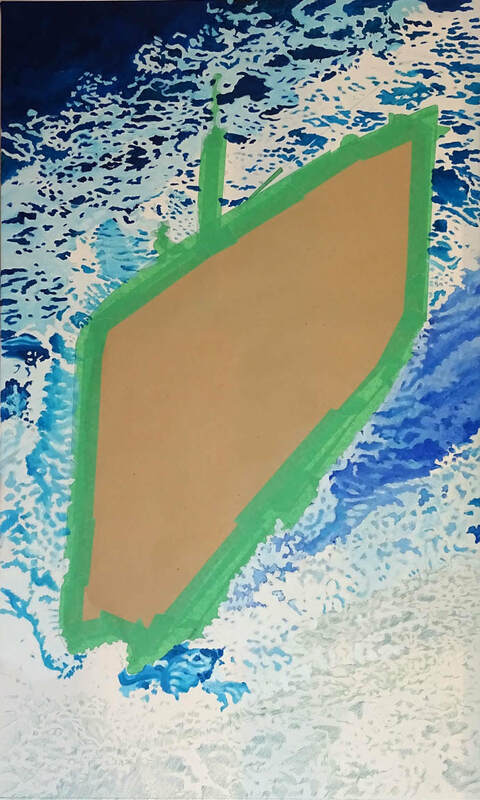 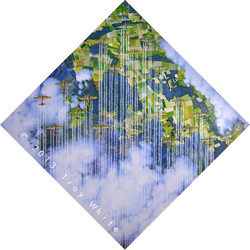 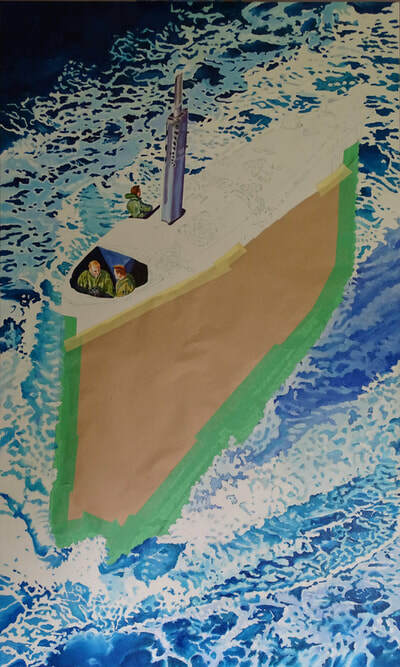 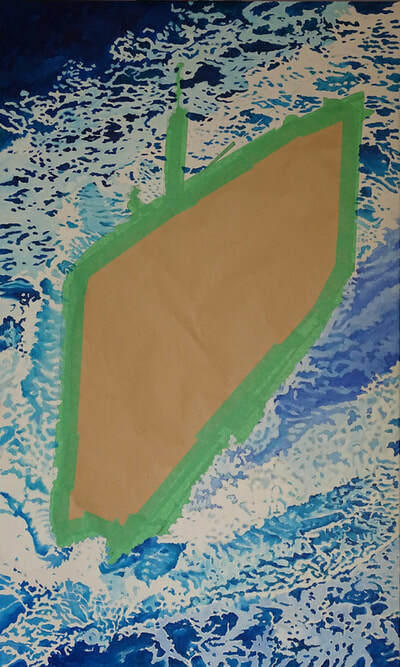 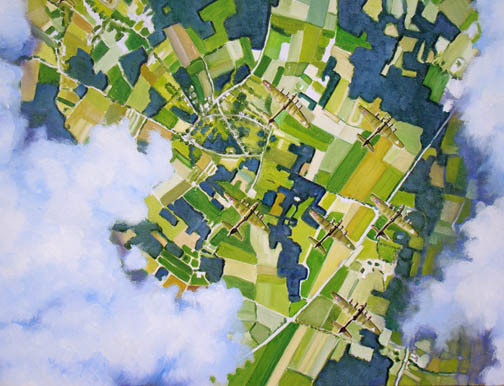 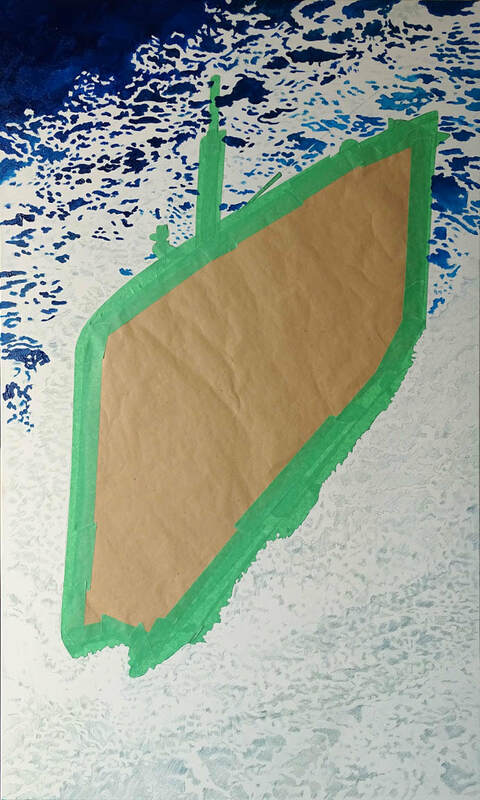 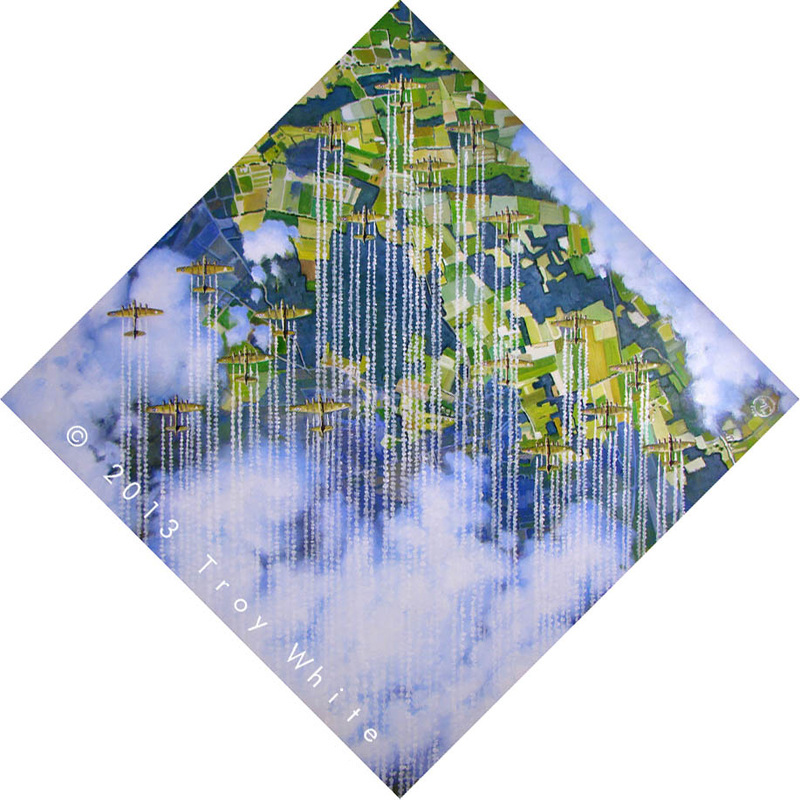 Elmer's poetic description of the 17 August mission as the aerial armada droned above the continent combined with his navigational notes helped me to pinpoint the image I wanted to portray in my painting. 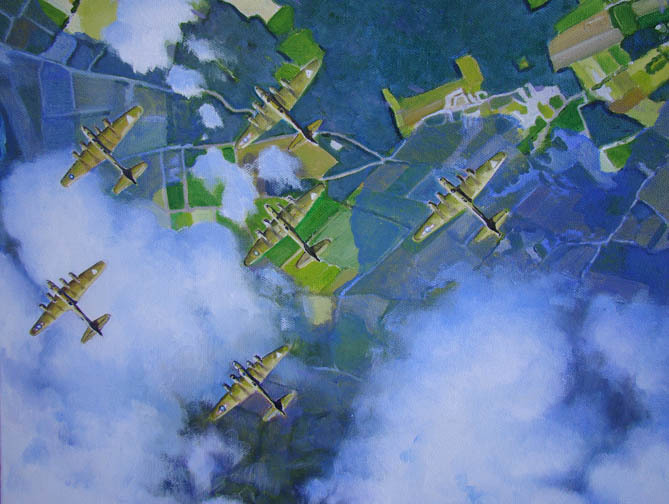 I decided I wanted to view a formation of Flying Fortresses from directly above, after it had made landfall but before it was set upon by defending German fighters. 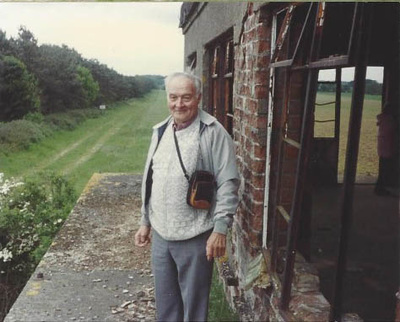 Bendiner wrote "We were somewhere between Antwerp and Aachen when I was aware of the first rocket attack." 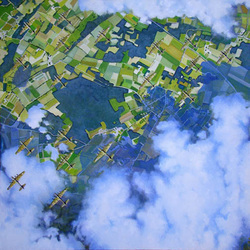 Somewhere between Antwerp and Aachen is where I have placed my formation. 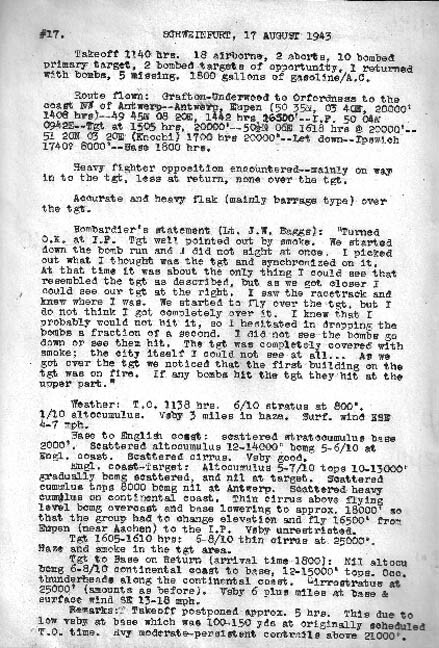 Despite the 17 August mission to Schweinfurt and Regensburg costing the 8th Air Force 60 B-17s and hundreds of lives, the results were such that a follow-up raid on Schweinfurt was required. 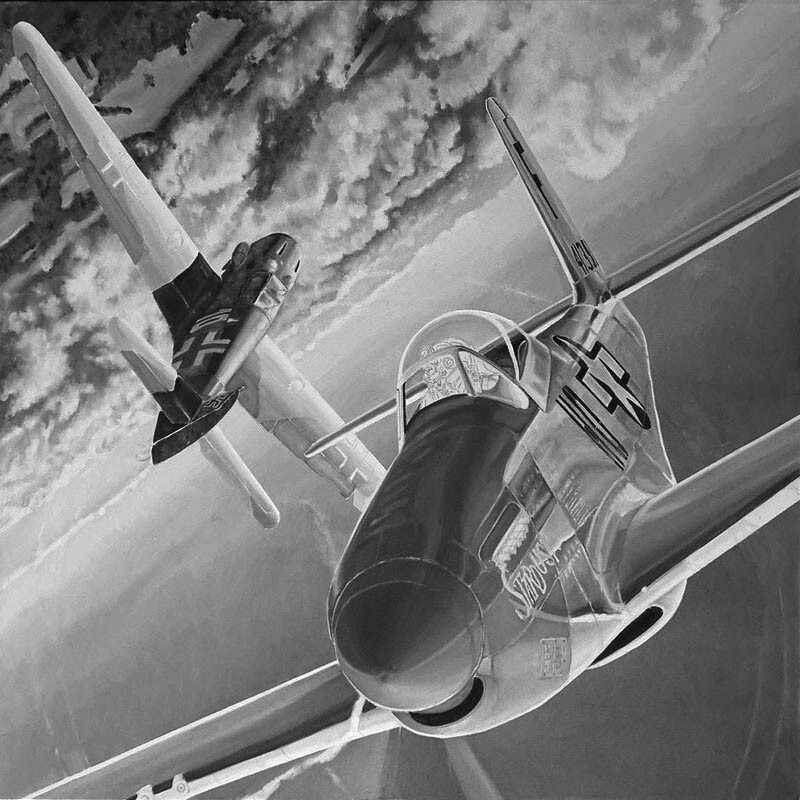 On 14 October the bombers returned to Schweinfurt and a further 60 bombers were sacrificed in what has come to be known as "Black Thursday". Although the raids caused a 38% drop in ball bearing production, the loss of 120 heavy bombers and 1,200 men amounted to 20% losses and called the USAAF's daylight bombing campaign into question. 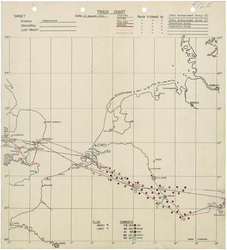 The massive losses in the bomber force meant that the 8th AF had not been able to deliver a knockout blow with follow up missions and in fact had been so depleted by the operation that they did not have the resources to mount raids of that scale again until January of the following year. By that time target priorities had shifted in anticipation of the invasion of France in June of 1944. 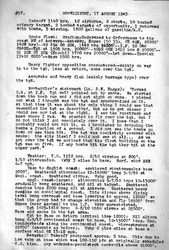 After the war the US Strategic Bombing Survey reported that “There is no evidence that the attacks on the ball bearing industry had any measurable effect on essential war production.” In all 138 heavy bombers and 1,380 airmen were lost in the ill fated missions against Schweinfurt, ostensibly as the result of a casual conversation at a cocktail party.